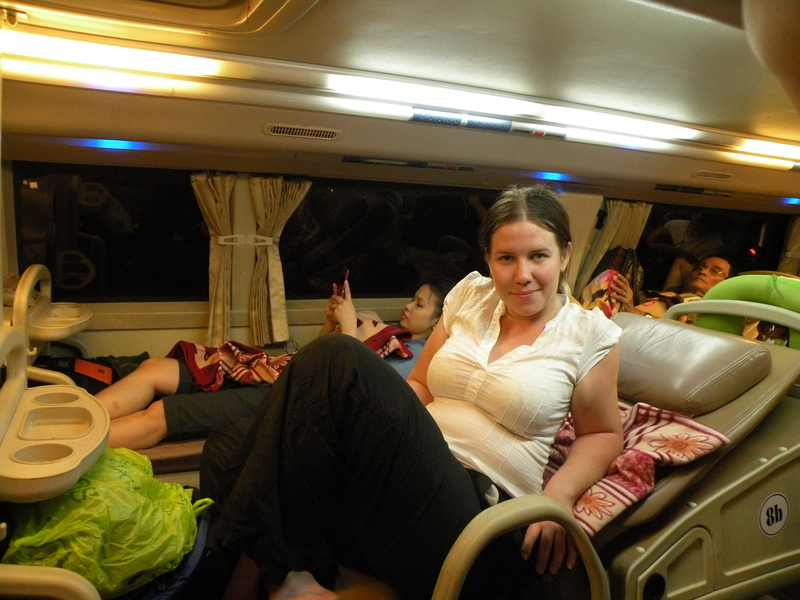 We left Hoi An on the bus and arrived in Hue after dark. I think we just let one of the tauters lead us to a hotel. It was cold and raining and we didn’t really want to walk around much. This is how we saw the best place on our trip. A restaurant, pub and cafe in one. We stayed at the hotel just opposite. I can’t complain. It was good standard but it was terribly cold. Well I suppose it would be perfect if the temperature outside was tropical heat. 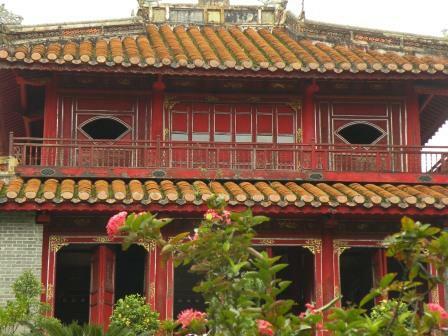 Hue served as Vietnam’s capital under the emperors of the Nguyen Dynasty from 1802 to 1945 and the city’s regal past can still be seen inside the walls of the Citadel and the Imperial City. Thanks to UNESCO funding, much of the City is being faithfully restored to its former glory. The Imperial City, created in the 19th century and modeled on the Forbidden City in Beijing, has many palaces and temples inside. 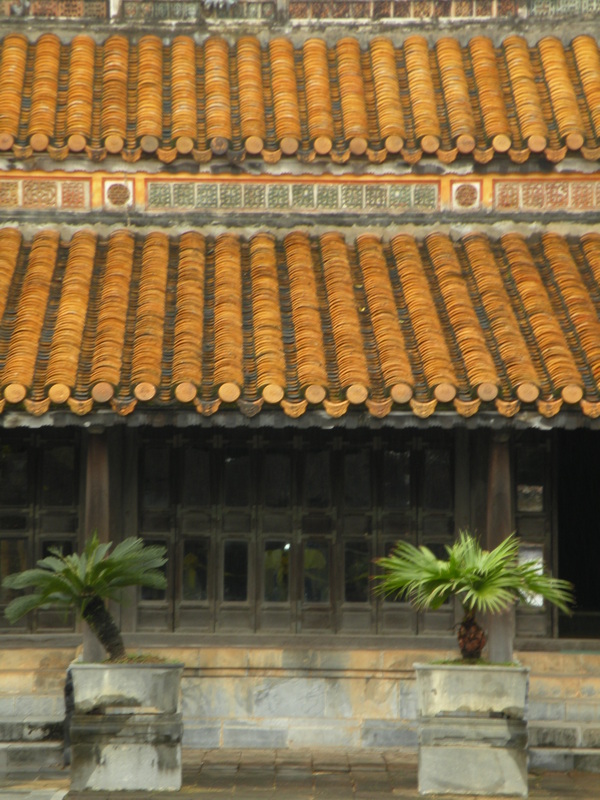 The seat of the Nguyen emperors was the Citadel, which occupies a large, walled area on the north side of the river. Inside the citadel was a forbidden city where only the emperors, concubines, and those close enough to them were granted access; the punishment for trespassing was death. Today, little of the forbidden city remains, though reconstruction efforts are in progress to maintain it as a historic tourist attraction. We decided to split. P. wanted to rent a motorbike and just drive around and I wanted to see the Royal Tombs with a guide. It was to be the highlight of our trip for me. I love the flexibility and no pressure to be together all the time. I think we were both happy about the choice we made. 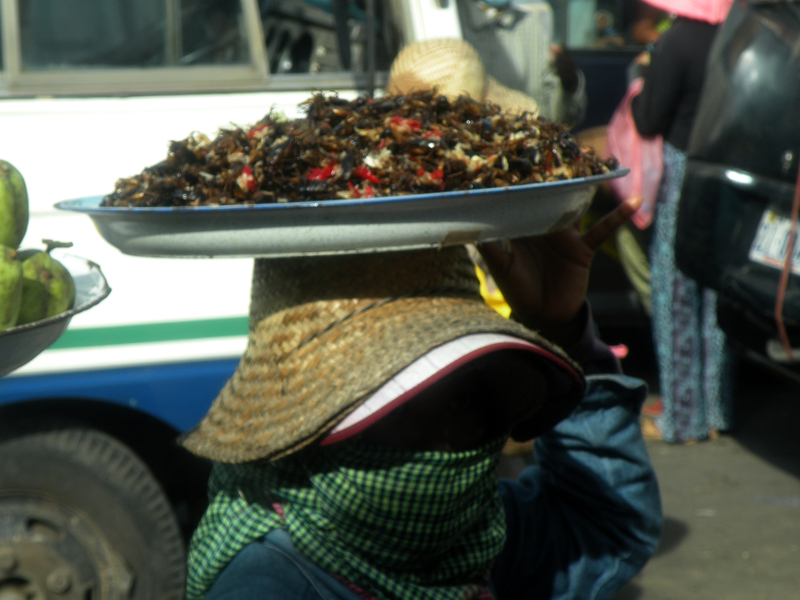 In short, from what P. told me, the ride around city was exciting and the traffic wasn’t as bad as in HCMC after driving around the center he decided to drive out of the city. There he almost had a terrible accident in a big puddle. Anyway I was glad he was alright. I have no idea what I would have done if he didn’t show up in the place where we were supposed to meet. Where to start looking? And when? We didn’t even have working mobile phones to get in touch. So I’m glad nothing happened. I went on a tour. It wasn’t organised by Cafe on Thu Wheels. If it wasn’t raining I think I would go on a motorbike tour they offer. Anyway, we had a bus. 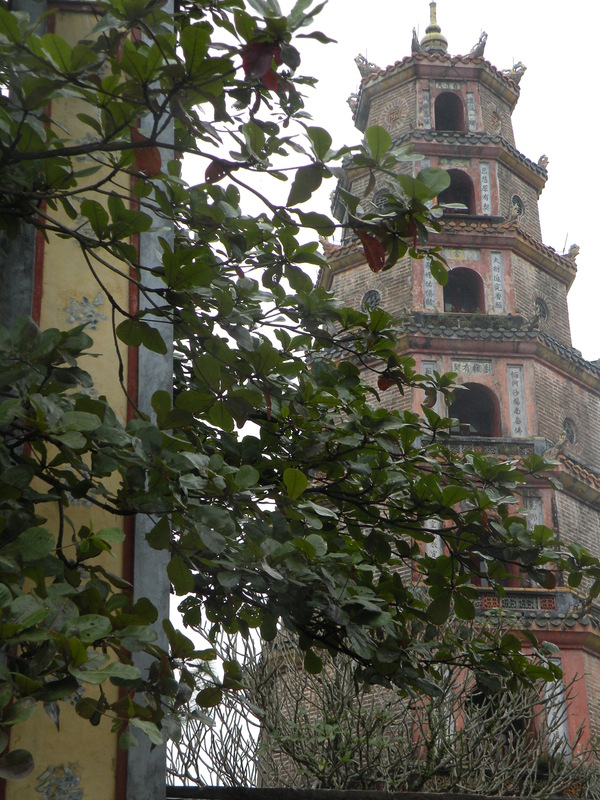 The first thing we saw was the Thien Mu Pagoda (pagoda of the Heavenly Lady). 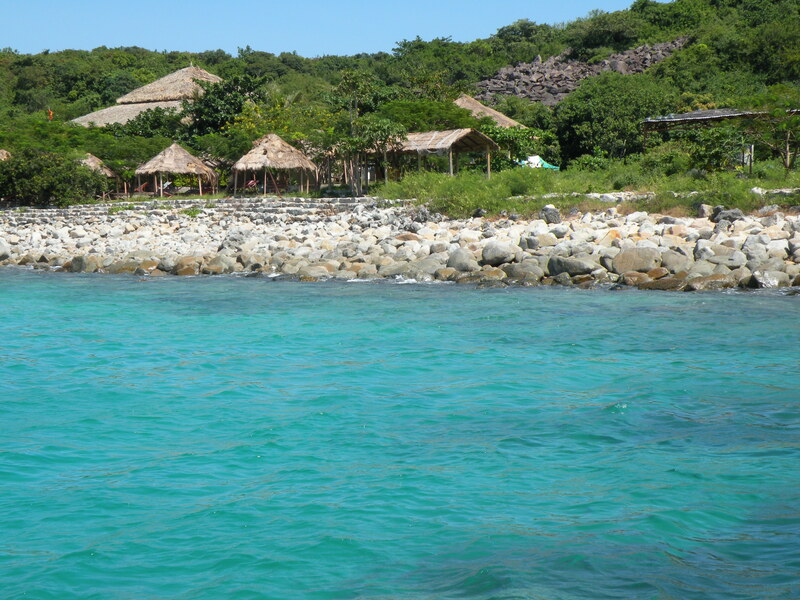 It is located on a hill overlooking the Perfume River. In the autumn, flowers from orchards upriver from Hue fall into the water, giving the river a perfume-like aroma, hence the soubriquet. Legend has it that the pagoda was founded after and old woman dressed in red gown and green trousers appeared on the hill and prophesied that soon a true king will come here and build a pagoda that will attract and converge all the heavenly forces and energies of the Dragon Veins. After saying it the woman vanished. And so it happened. I guess you can call it a self-fulfilling prophecy as the king that build it heard it before he made a decision. The most characteristic building is the wedding cake like tower. 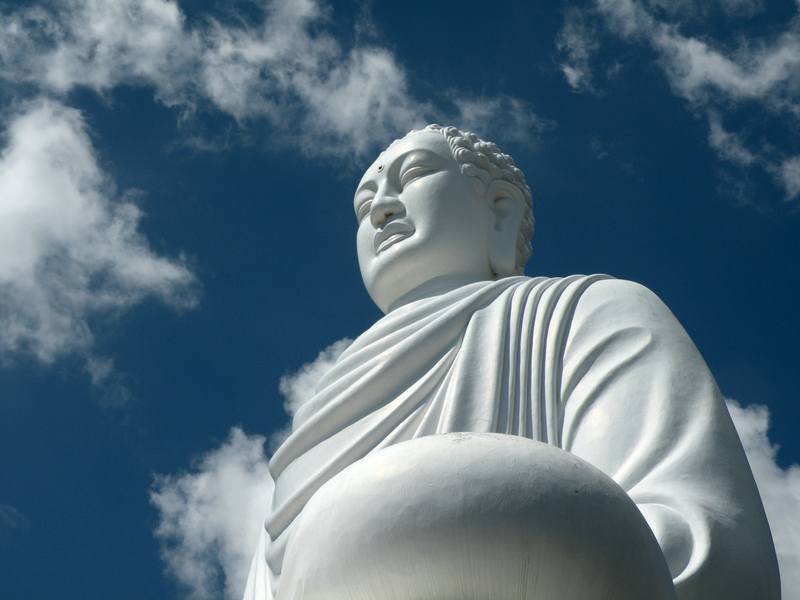 It has seven storeys which represent incarnations of Buddha. We then visited a garden. It was a special garden with different types of plants and flowers. I think it was Ngoc Son which was the former residence of the Princess Ngoc Son, daughter of Emperor Dong Khanh. But it might be some other garden as well. it wasn’t a big thing for me and maybe because of the season it wasn’t anything special. Almost no blooming flowers, everything wet and gray. Well you have to pay a price for travelling out of season. I was really looking forward to the tombs. So let’s move forward to it. 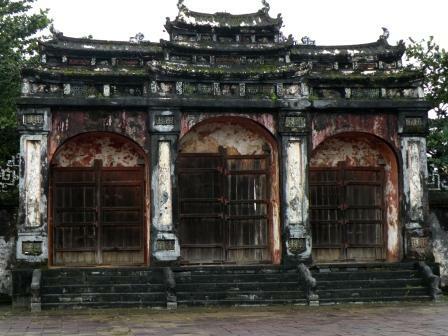 When you think about royal tombs in hue think more of a pleasure grounds and temples than cementaries and mausoleums. They combine park like landscapes and lakes with traditional architecture. Each tomb consists of: a pavilon housing a stele recording the emperor’s achievements, a brick paved court of honour where life sized stone mandarins and animal figures stand in attendence, a tample with funerary tablet and precious items belonging to the emperor, a masoleum and houses for guards and servants. Each of the tombs is different though. Minh Mang was possibly the greatest of Nguyen emperors. This 28 hectare tomb is surrounded by an oval wall of 1700 meters. Originally, the tomb consisted of 40 architectural constructions symmetrically arranged along a 700 meter axis. It is known for its solemnity and precise layout. It is a UNESCO World heritage Site. 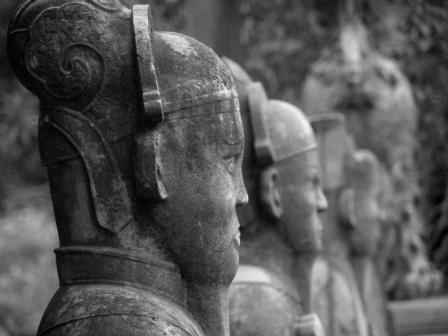 On the Salutation Court there are the Thahn stone statues of great mandarins, along with elephants and horses representing the royal entourage that accompanies and protects the emperor in the other world. 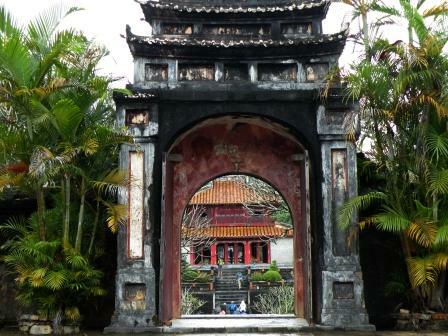 The Salutation Court is divided into four steps – The Hien Duc Mon (gate) leads to the worship place. 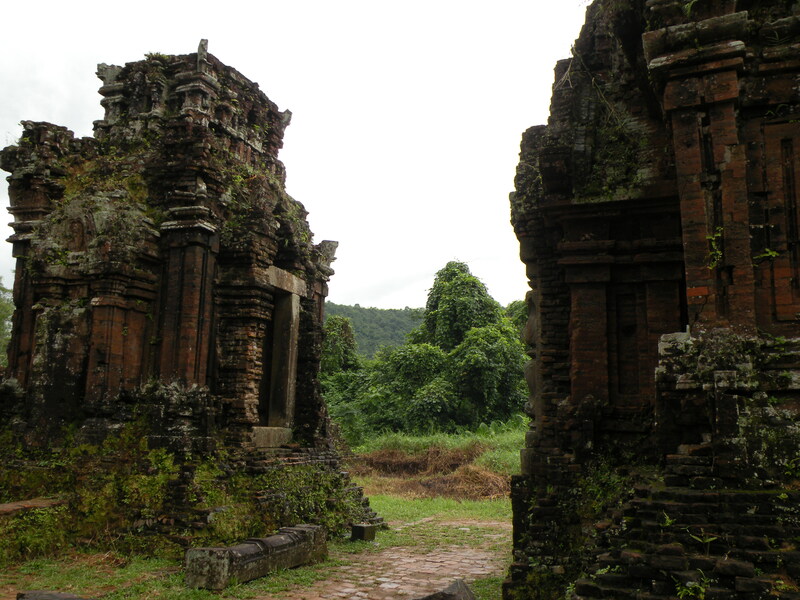 In the centre is Sung An Temple surrounded by Ta, Huu Phoi Dien (Left, Right Temples) in the front and Ta, Huu Tung Phong (Left, Right Rooms) in the back. 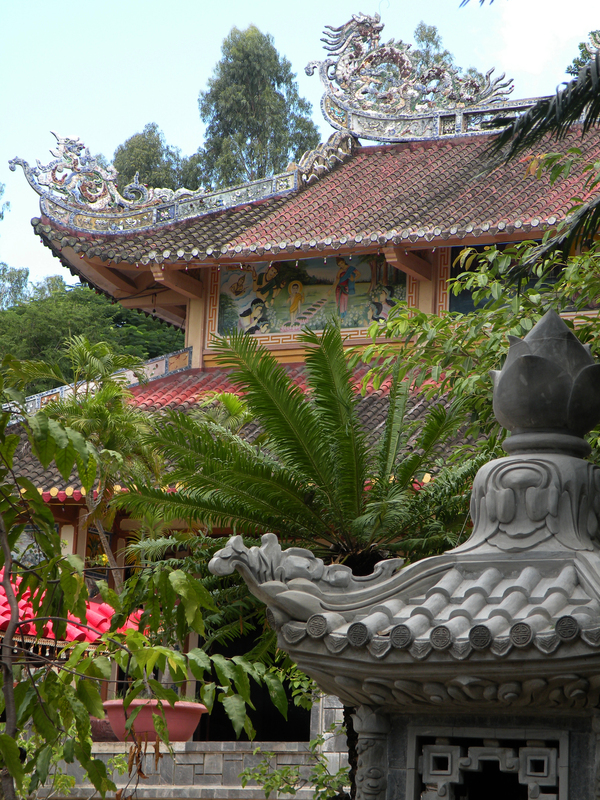 The Emperor and Queen Ta Thien Nhan are worshipped in Sung An Temple. 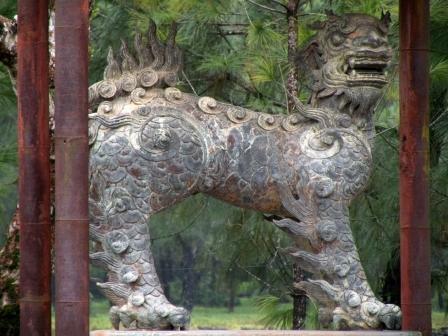 Finally, the Hoang Trach Gate leads to the Minh Lau Bright Pavilion. It is placed on top of three terraces representing heaven, earth and water. 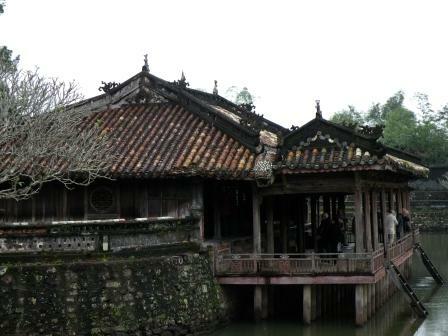 It is a square pavilion with two storeys and eight roofs. The Minh Lau Pavilion radiates a remarkable, mystical atmosphere; it also features an anthology of selected poems of Vietnam’s early 19th century. 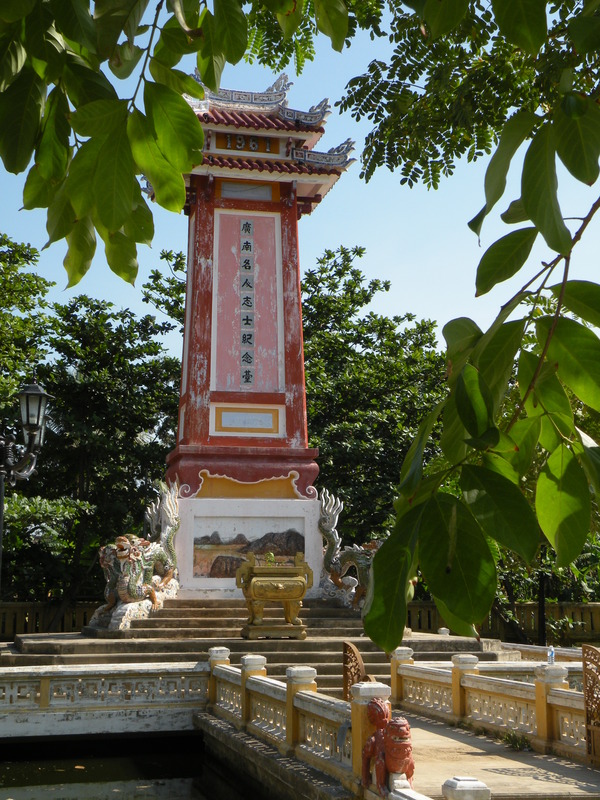 On both sides of Minh Lau, two obelisks stand on the hills. 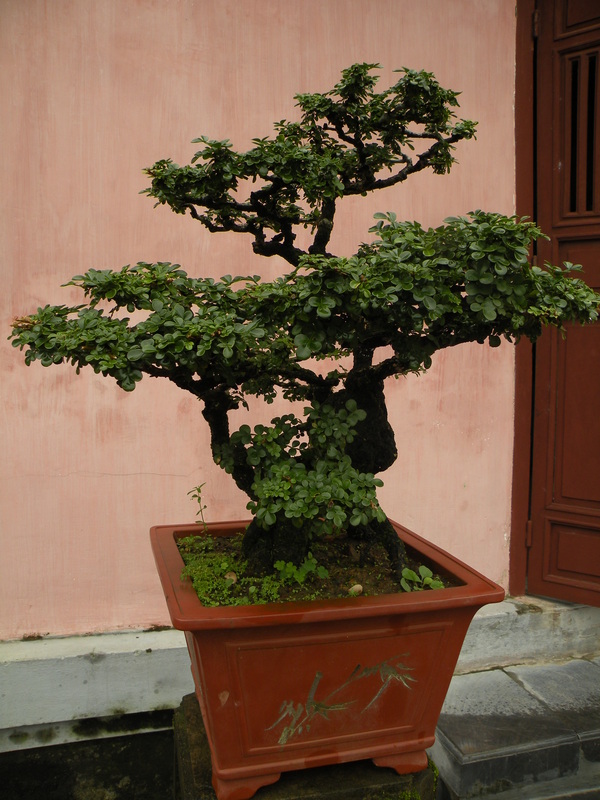 In the back of Minh Lau are two flower gardens designed as the character “Longevity”. The stele house keeps the Thanh Duc Than Cong Stele consistion of an essay of 2500 Chinese characters of Thieu Tri emperor that was carved to praise the contribution of his emperor-father Minh Mang and to describe the tomb constructing process. The tomb (Buu Thanh) – Tan Nguyet (New Moon) crescent Lake embraces the circular Buu Thanh (The wall surrounding the grave). There are three bridges on Tan Nguyet Lake. Visitors have to climb 33 Thanh stone steps to reach the sepulchre of the Emperor. We were in fact not allowed to climb those stairs I think because of the restoration works. Located in a narrow valley, Tu Duc Tomb is one of the most beautifully designed complexes among the tombs of the Nguyen dynasty. 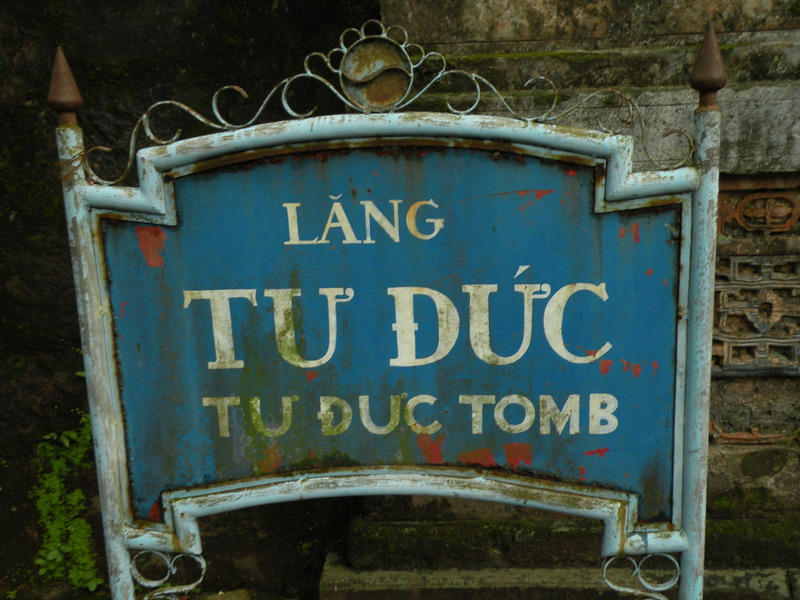 Embedded in a lush pine forest, this tomb is the final resting place of Emperor Tu Duc who had the longest reign of all emperors of the Nguyen dynasty. 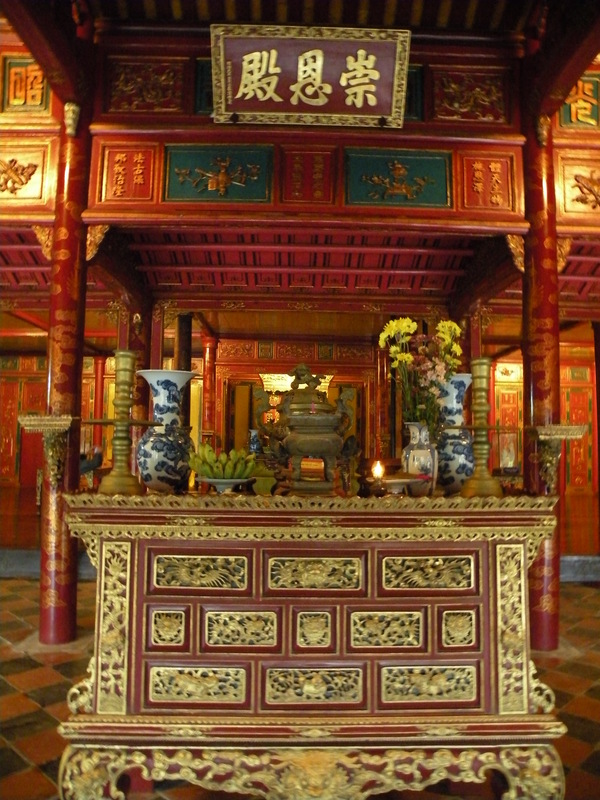 In his lifetime, the Emperor Tu Duc used the tomb as a palatial retreat together with his many wives and concubines. The enormous costs, extra taxation and forced labor necessary to build the tomb caused protest among the workers, who attempted a coup in 1866. With the help of his generals Tự Đức was able to suppress the coup and continued enjoying the palace within the tomb for the remainder of his life. 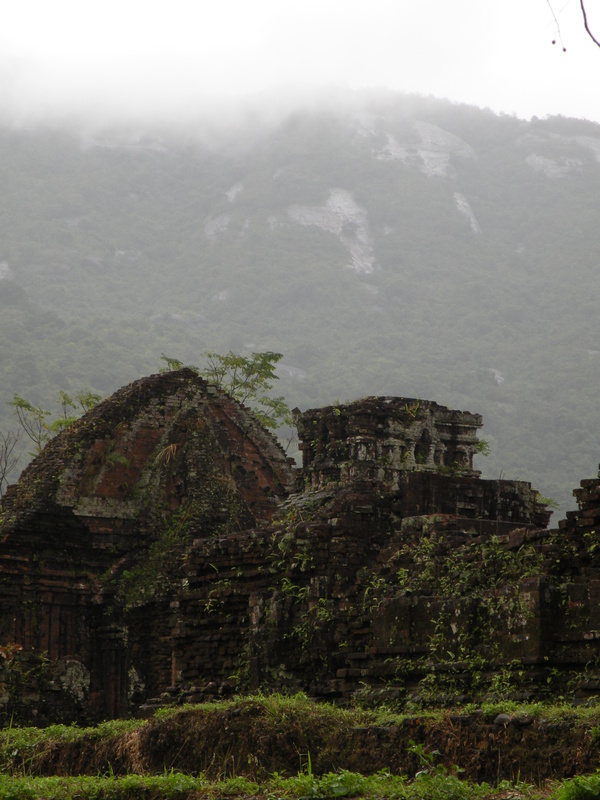 The royal amenities available at this tomb are unmatched by any other such structure in Vietnam. Although the Emperor had over a hundred wives and concubines, he did not have any offspring. Lacking a son to write his biography and merits, which would be part of the stele inscription, the task fell to himself, a circumstance he considered to be a bad omen. His modest self-composed epitaph can now be found inscribed on the stele in the pavilion, to the east of the tomb. The stele for Tự Đức Tomb was brought there from a quarry over 500 km away, and it is the largest of its type in Viet Nam. It took four years to complete the transport. 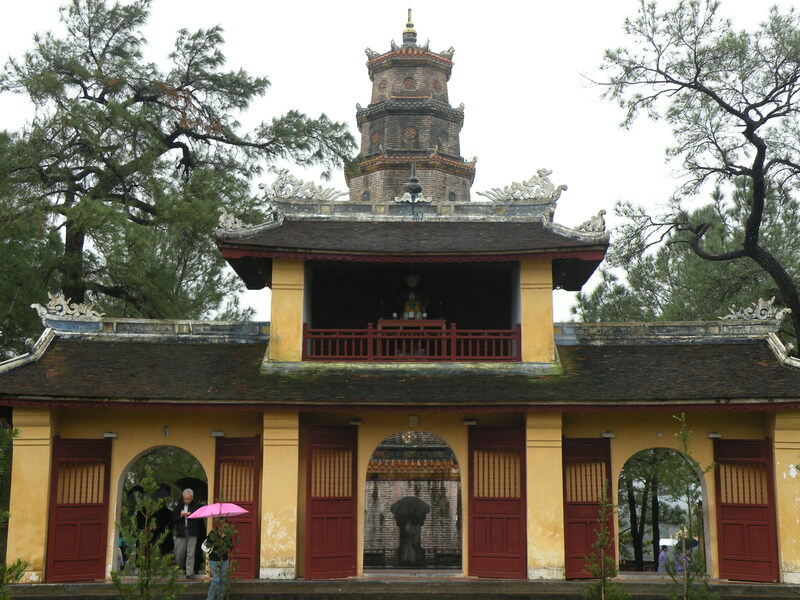 The tomb’s palace area has a lake where the Emperor used to boat, a small game hunting ground on a tiny island inmidst the lake, and the luxurious Xung Khiem Pavilion where Tu Duc is said to have retreated to relax and recite or compose poetry in the company of his concubines. It was in fact designed by the emperor as a secluded poetic fairyland where he could write poetry and enjoy life’s pleasures and, in death, find a harmonious resting place. It comprises 50 structures enclosed by 1500m wall. 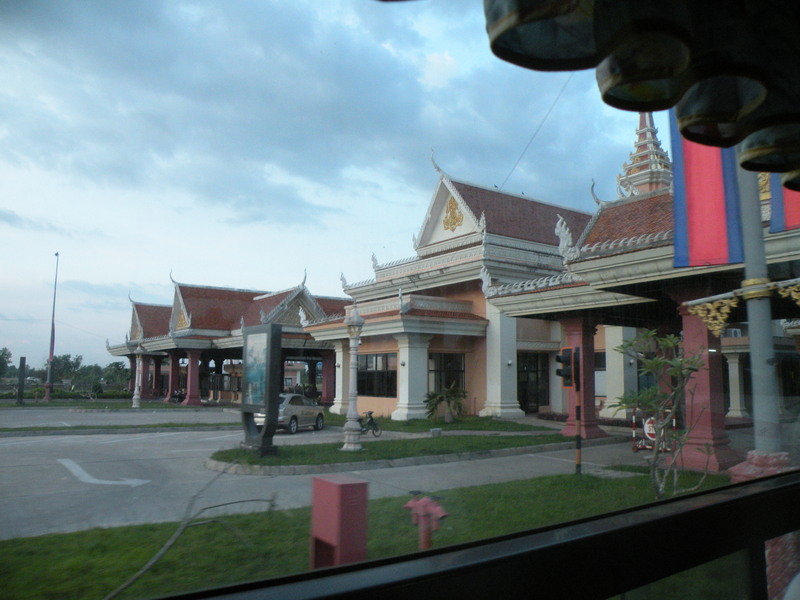 The entrance is a Vu Kiem Gate in the south. To the right is the Luu Khiem Lake with Tinh Khiem islet in the middle. 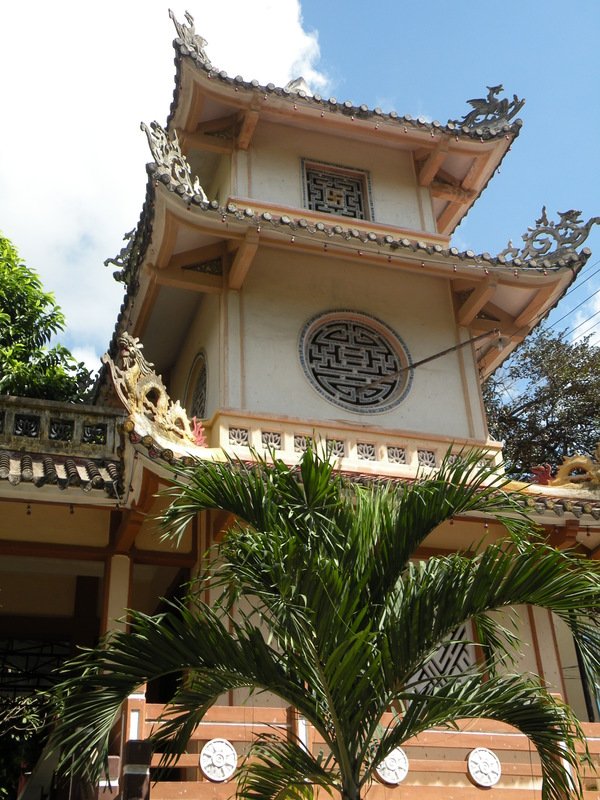 On the tomb complex you can also find Minh Khiem royal theatre and Hoa Khiem Temple used as a palace during Tu Duc’s lifetime. What is funny is that the emperors remains are not there, his burial site is unknown. I didn’t include many photos of Tu Duc Tomb in the text above, I will add some more in the slideshow below. From hue we took a train to Da Nang and then a flight back to HCMC. On the train which was better than our regional services in Poland a steward was serving a soup, courious thing. There was also a lovely girl, picture in the slideshow. It was hard to go back but to be honest I was looking forward to sleeping in my own bed. I think first time in my life I was exhausted with the holidays and finally taking a week off to rest after holidays started to make sense. We got very late back to London (flight through Bahrain) and it was so windy and called I hated it streight away. 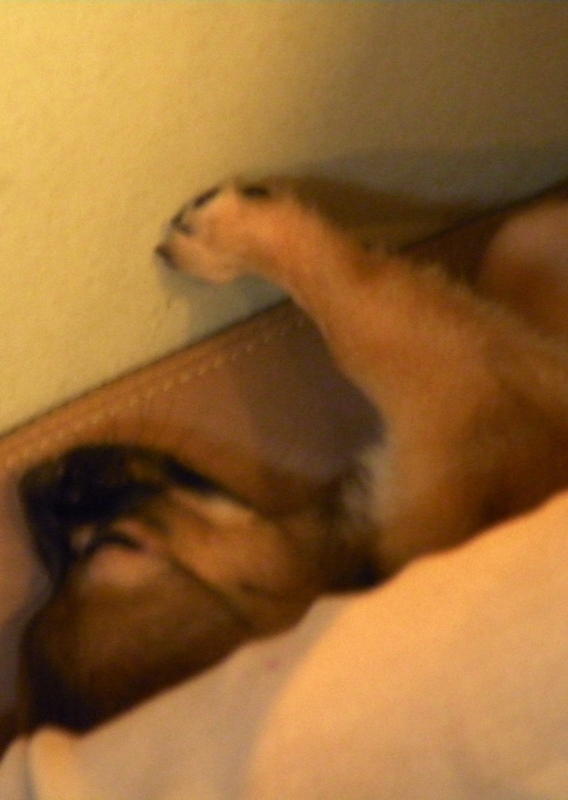 Now when I don’t remember the constant tiredness I start to appreciate how much we saw. The thing is, I know the balance between doing nothing and seightseeing is crucial. I think I’m just greedy, want to see as much as I can and sometimes it’s just so hard to give something up and choose. Unless you have unlimited time and money you have to make smart decisions. These were the words of our guide in My Son. You should hear his low voice, accent and intonation. It reminds me of Samurai talk in Kurosawa movies. P. can really do this talk. 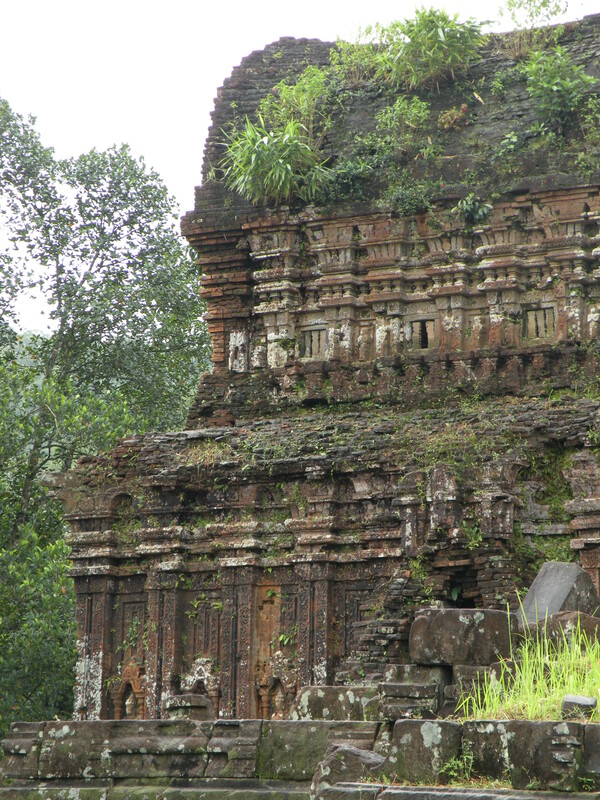 In Duy Phu Village, Duy Xuyen district, Quang Nam province, at My Son valley, there is still a most important complex of Hindu temple-towers which is a symbol of Champa art and countinuously developed from the 4th century to the 13th century. Because of its prominent value as an example of cultural exchange and integration of external cultures, especially the art and architecture of Hinduism with the native culture, combined with lively reflection of the Champa Kingdomin South East Asia cultural history, in December 1999, UNESCO listed My Son a World Cultural Heritage. 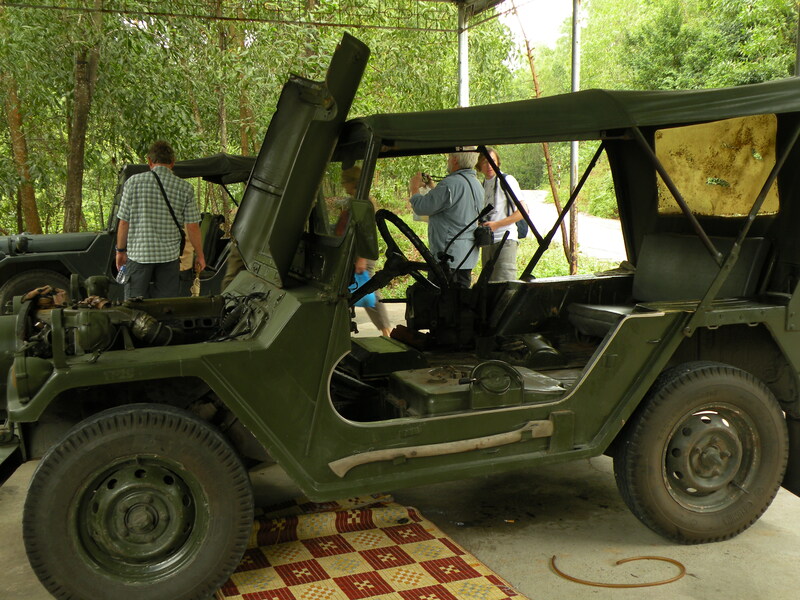 The day was rainy we got to the site and followed our guide to jeeps. We got really excited. I think it was my second life in this type of a car. For me they seemed to be those old American ones you could see in M.A.S.H. 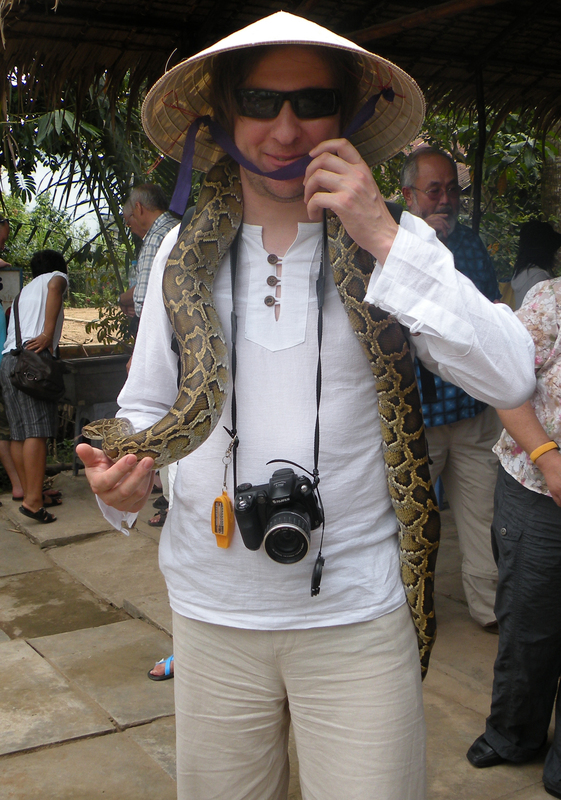 There was going to be a ride through jungle and I got to sit on the side. This site is truly worth the visit and the guide was very funny and outgoing. The history od Cham people and their religous celebrations were very interesting. As in many places around the World you can find phallic symbols that mingt not be so obvious in the first place. Like the piramid shape of a roof in a tower underneath which and altar in a shape of phallus is located. The pictures will come later keep on reading. 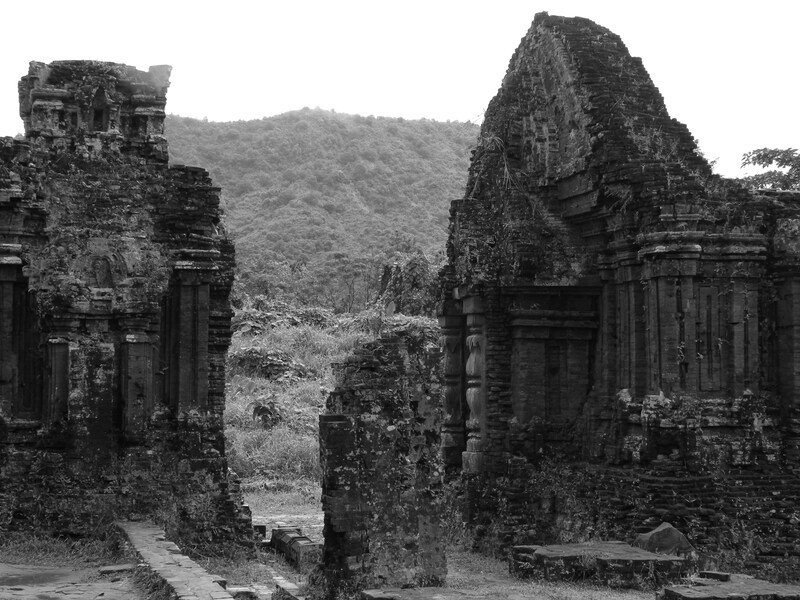 The American War destroyed many of the site’s temples. The Viet Cong had used My Son as a key base which forced US bombing of the site leaving about 20 of the original 70 structures intact. Bomb craters next to some of the temples are clearly visible. Now you understand why the guide was warning us to follow his footsteps and not to wander too far from the main area. You never know when you step on a mine or a bomb. My Son is located in a picturesque valley surrounded by hills and overlooked by Cat’s Tooth Mountain (Hon Quap) – also called My Son mountain (“Good Mountain”). Clear streams run between the structures and past nearby coffee plantations. Some people compare it to Angkor, I think I wouldn’t go as far as that, but still My Son is impressive and seems more wild and adventureous than Ankor. I love the way hills are covered with jungle. It might be hard to imagine how different it looked in it’s heyday. 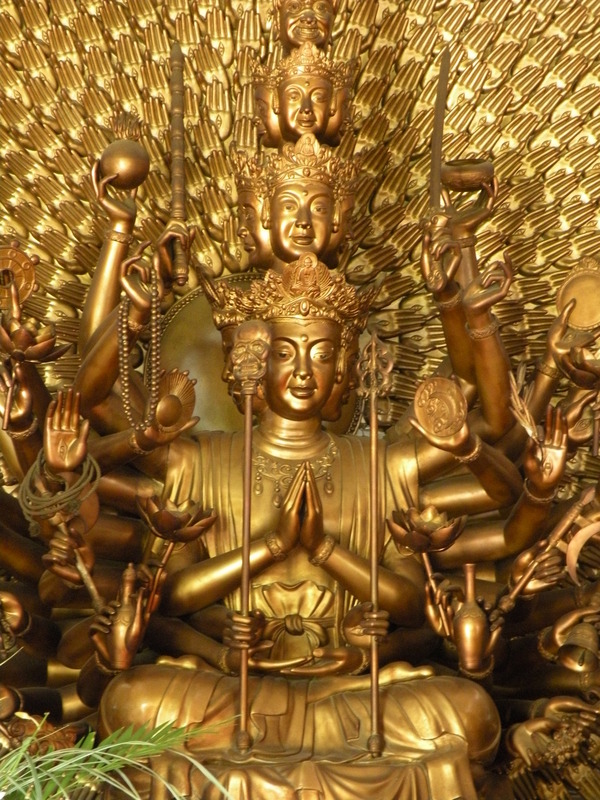 It has been said that at the height of the Cham power, the summits of the temples were layered in gold but these have been stripped since by various invaders. Each historical period has its own identity, so that each temple worshipping a genie or a king of a different dynasty has its own architectural style of different impression. All of the Cham towers were built on a quadrate foundations and each comprises three parts: a solid tower base, representing the world of human beings, the mysterious and sacred tower body, representing the world of spirits, and the tower top built in the shape of a man offering flowers and fruits or of trees, birds, animals, etc., representing things that are close to the spirits and human beings. The site is divided into different parts coded by letters from A to N.
Group A and A’ (also called Pagoda tower by the local) consist of 17 works. Group B, G, D (Market tower) consist of 27 works. Group E, F (Hd Khé tower) consist of 5 works. Group H (Chess tower) consist of 4 works. Group K consist of2 works. .
A 24 metres high tower was found in the Thap Chua area (coded A1 by archaeologists and researchers on My Son). This tower is a masterpiece of ancient Cham architecture. It has two doors, one in the east and the other in the west. The tower body is high and delicate with a system of paved pillars; six sub-towers surrounding the tower. This two-storey tower looks like a lotus flower. The top of the upper layer is made of sandstone and carved with elephant and lion designs. In the lower layer, the walls are carved with fairies, water evils and men riding elephants. The main tower (kalan ) symbolizes the sacred mountain (meru ) at the centre of the universe. The square or rectangular base (bhurloka ), representing the human world, is built from brick or stone blocks and decorated with reliefs. Above this rises the main tower (bhuvakola ), constructed entirely in brick, with applied columns and a false door facing east. The interiors are plain, with small niches for lamps; the Shivalingam was situated on a plinth in the centre. It symbolized the spirit world. The towers were separated from their roofs (suarloka ) by a decorated frieze. The two long mandapas, assembly halls were built for pilgrims who used the halls to prepare offerings for temple visits. The best preserved object is a library where holy books were stored. See picture on the left and detailed cravings on the wall on the right (black and white picture). There is a Polynesian, Javan influence in the shape of the inverted boat. As our guide said: “Cham people came from Jaaaaavaaaaa” (it’s funny only when you hear him saying it, when you visit you will understand). Inside E1 temple was a altar consisting of assembled sandstone blocks, (displayed at Ba Nang Museum of Cham sculpture). 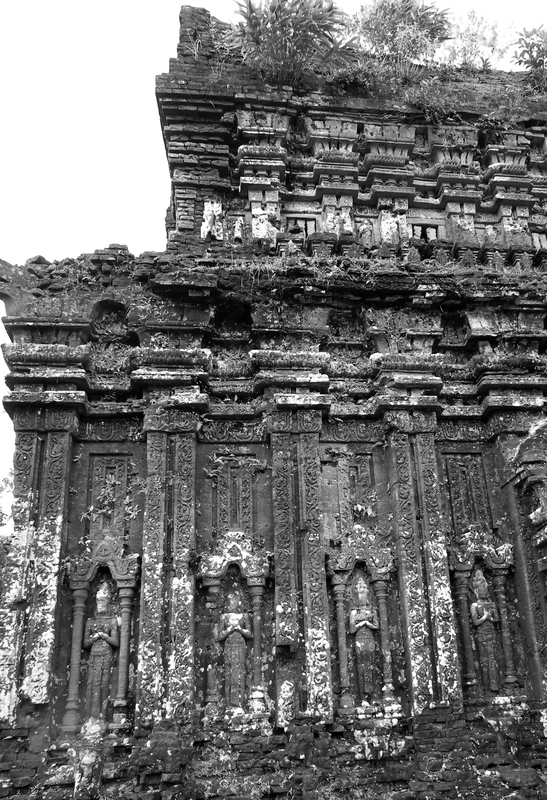 It was delicately carved with sights of dancing, playing stringed instruments and flute; and uninterrupted chain of carving including the activities of Brahmins such aspreaching, preparing drugs, treating, etc…These sights were separated by leafy decorative motifs stylized by curved lines tocreate retroversion in the middle of which there are diamond- shaped frames alternating with flowers. The two gate towers, you can see on the left are located west of E1 temple. Coming back to the promissed phallic symbols, some of them are more obvious. Have a look at this two 1000 year old stone sculpture on the right that leaves little to the imagination. 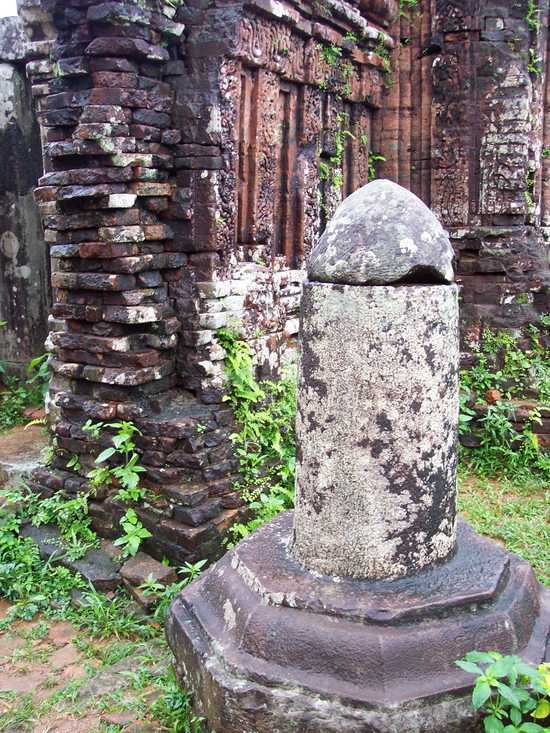 A linga (or lingam) is a phallic post that serves as a representation of Shiva. Cham kings frequently erected and dedicated stone lingas as the central religious images in royal temples. 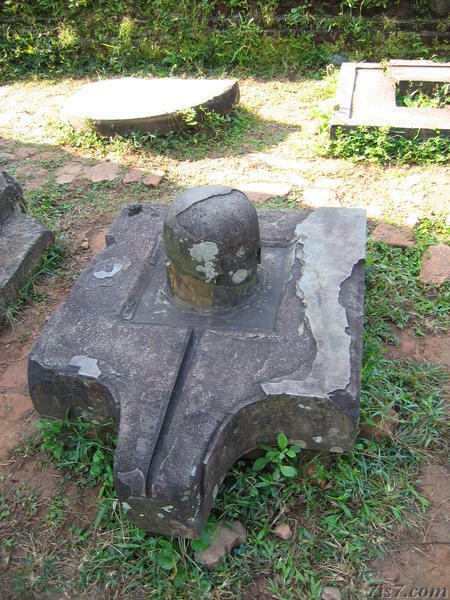 The name a Cham king would give to such a linga would be a composite of the king’s own name and suffix “-esvara”, which stands for Shiva. The linga, the mukhalinga, the jatalinga, the segmented linga, and the kosa were the main symbols of Cham Shaivism. If you follow the link to Wikipedia you will find out the difference. The largest collection of Cham art is on exhibit at the Museum of Cham Sculpture in Da Nang. Exhausted, sick and sore we got to Hoi An. Bent under the weight of our backpacks we did not intend to look for a place to stay for long. I think we went into maybe three hotels. We chose the least expensive, but still comfortable with a swimming pool and got straight into bed, ok shower (warm shower) was first. 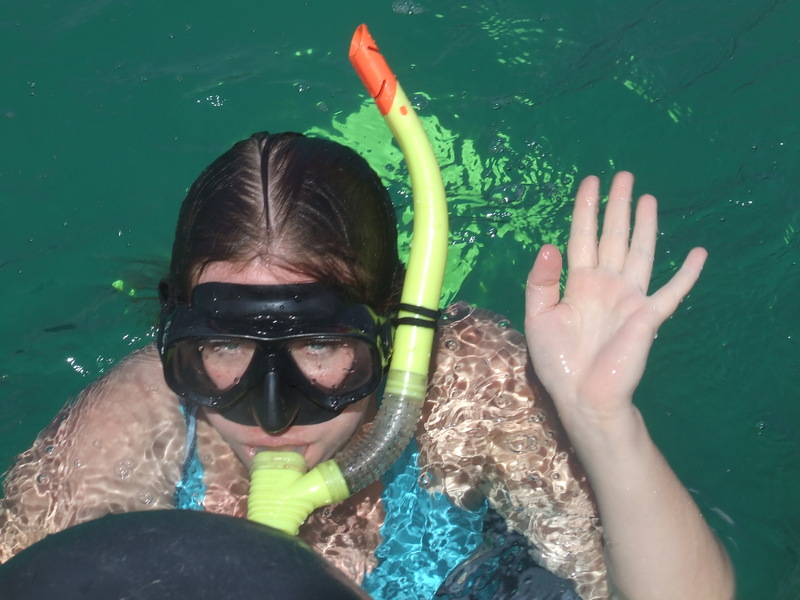 And let me tell you not everywhere we had warm water. And then the air conditioning was shut down because of some external works in the street. I suppose for people used to living in hot climate the change between coolness of an apartment building and very hot outside is someting usual but I felt uncomfortable every time it happened and staight away I got running nose. Being sick in hot climate, without air conditioning, feels really bad. Anyway, we stayed there for two nights and in that time we both got better. We used the swimming pool in the hotel with freezing water what felt good. 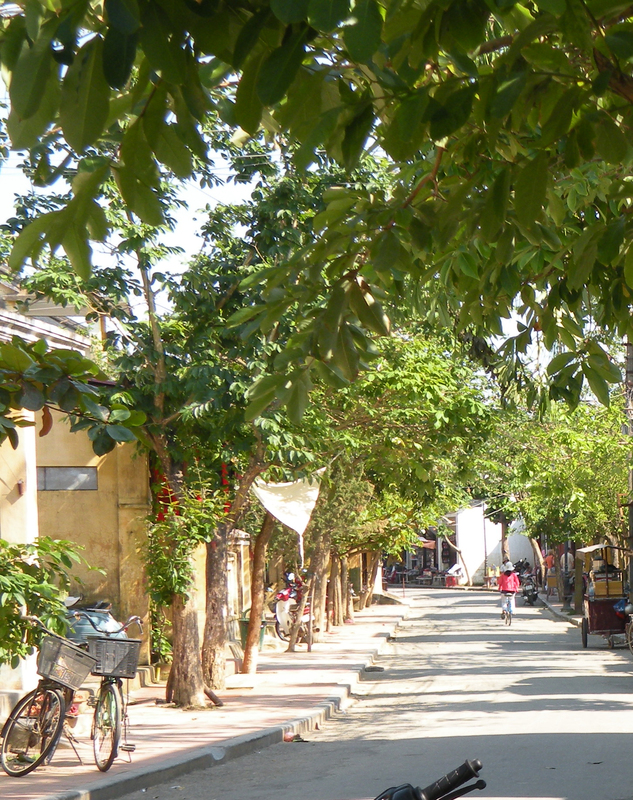 It all goes into oblivion when you consider the beauty of Hoi An. Rambutan (Chôm Chôm) also known unofficially as Hairy Cherry, has its origin in the tropical low-lands of Malaysia. The name rambutan came from the Malay word ‘rambut’ for hair. 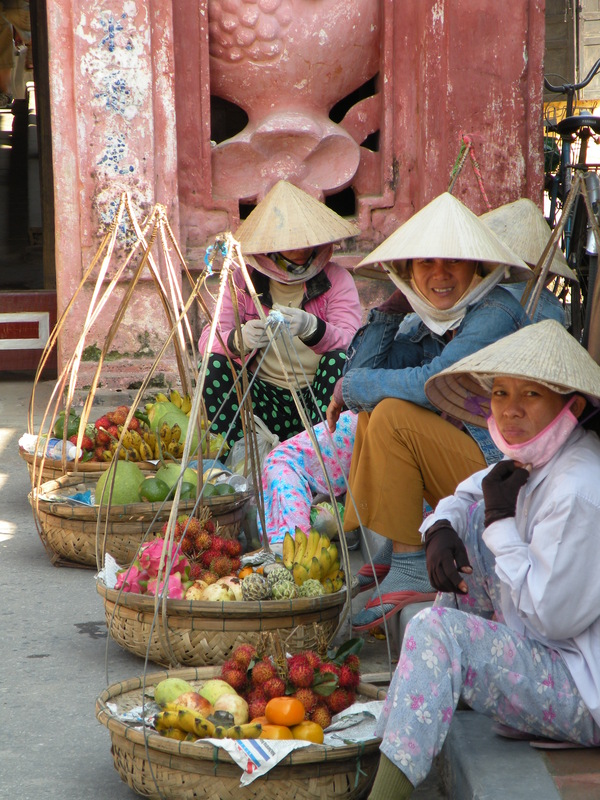 Today, the rambutan is grown in the Mekong Delta of Vietnam. The fruit is about 5 cm long and has soft fleshy hair from 2 to 3 cm long over the entire surface. 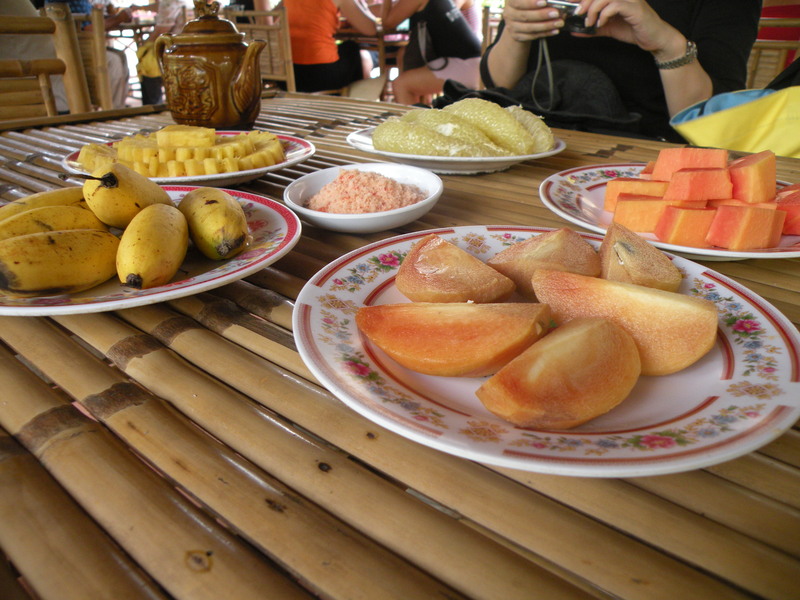 Sweet-sop (Na or Mãng Cầu Ta) also called sugar-apple, and custard-apple comes from South America. Like the pomegranate, the sweet-sop is packed with seeds. The edible pulp is a thin layer covering the individual seed. The outer layers appear to be rough and scaly. The fruit is green even when it is ripe. It reminds me of a huge artichoke. Longan (Nhãn) in Vietnamese, “long nhan” means dragon eye. The Longan is a close relative to the litchi. Longans are grown mostly in the cooler highlands of South-East Asia. It was brought here by Chinese immigrants as they migrated south and settled in various areas. The peel is brown and brittle. The meat is translucent white and is very juicy and sweet. 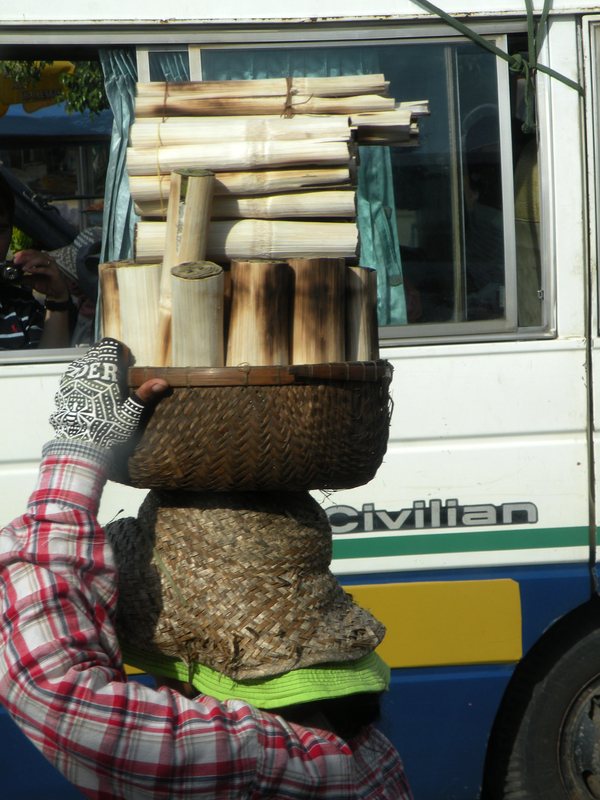 In Vietnam, dried longans are cooked in water to make a dessert drink called ‘nuoc long nhan’. Guava (Ổi) the fruits are round or with thin dark green skin which becomes yellowish green as the fruits ripen. The fruits range from small tomato size to as large as 13 cm in length. The flesh is crunchy much like eating a slice of apple. 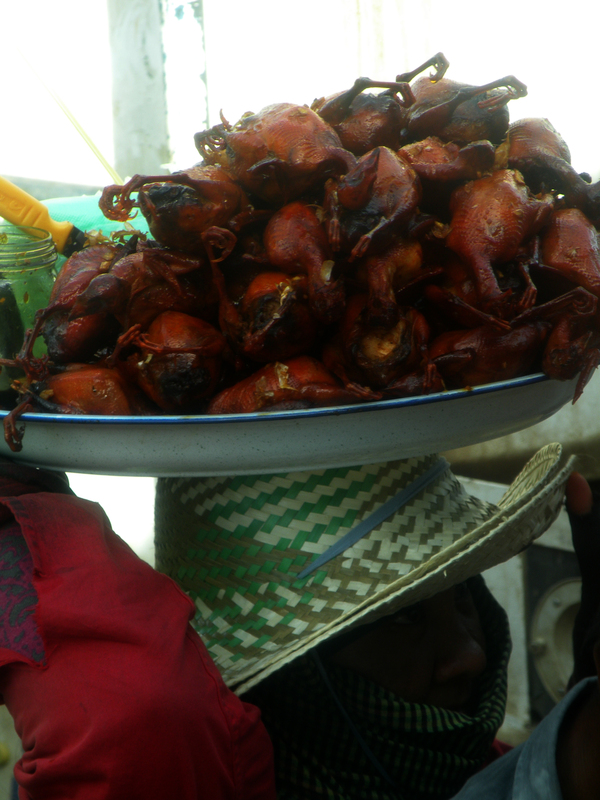 Sometime, the guava slice is dipped in a mixture of salt and grounded red chili pepper. The Mekong Delta’s Xá Lị variety is probably the most famous in all of Vietnam. Pitaya (Thanh long) meaning blue dragon. The round fruit is bright pink-purple and its leathery peel is in layers and turned up at the tips, supposedly resembling a dragon’s horns. One easily peels it by hand to reveal its white flesh, studded with tiny black seeds. It has a mild and refreshing flavour, with a texture similar to kiwi fruit. 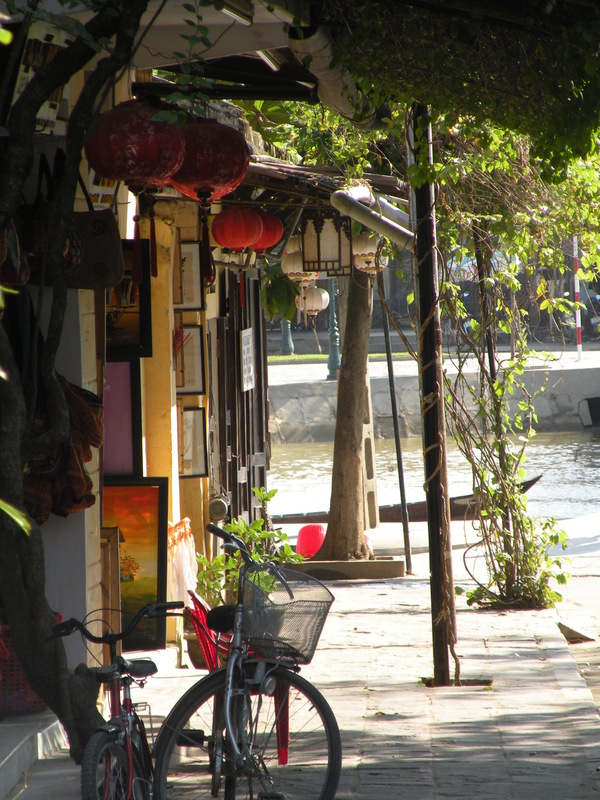 Hoi An is a very well preserved trading port enlisted as UNESCO World Heritage Site. Being there you feel like in a time trap (besides the tourists). You can clearly see the Chinese and Japanese influences all around the town. Before entering any of the temples, public houses museums or private houses you need to purchase a ticket which includes a choice of several. If you would like to see them all you will need to buy two or three tickets. 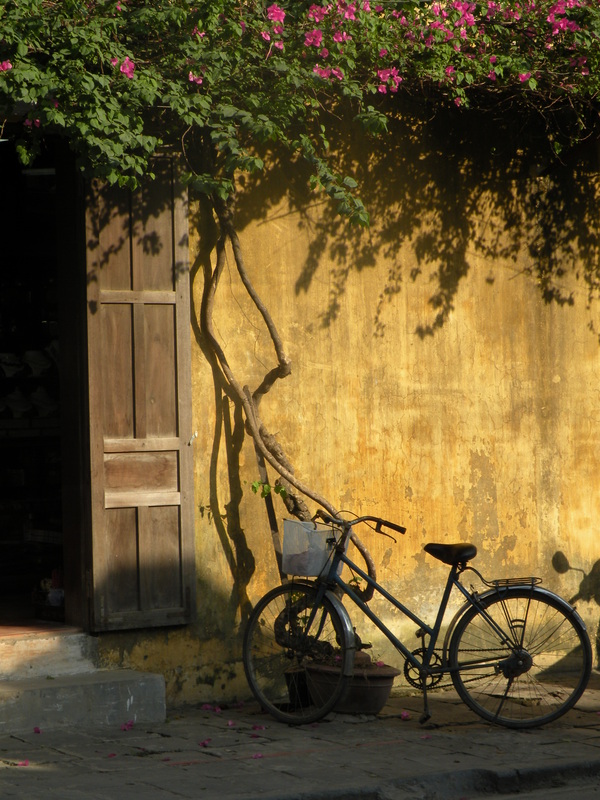 What I remember the most about Hoi An is its atmosphere and genuine charm which was hard for me to capture in the pictures. As you can see the list of sights on many other web-sites I will stick to showing you my best shots of the town. Let me also tell you that sitting in a bar on a river bank and drinking local beer is one of the best moments in Vietnam. I wished we stayed there longer. Patriotic theme: Kazimierz Kwiatkowski (1944-1997, in Vietnam known as “Kazik”) – a Polish architect, restorer. Directed the work of conservation in Vietnam from 1981 until his death in 1997 he has been dedicated a commemorative plaque in the Purple Forbidden City (Imperial Palace) in Hue, and the religious sanctuary of My Son. 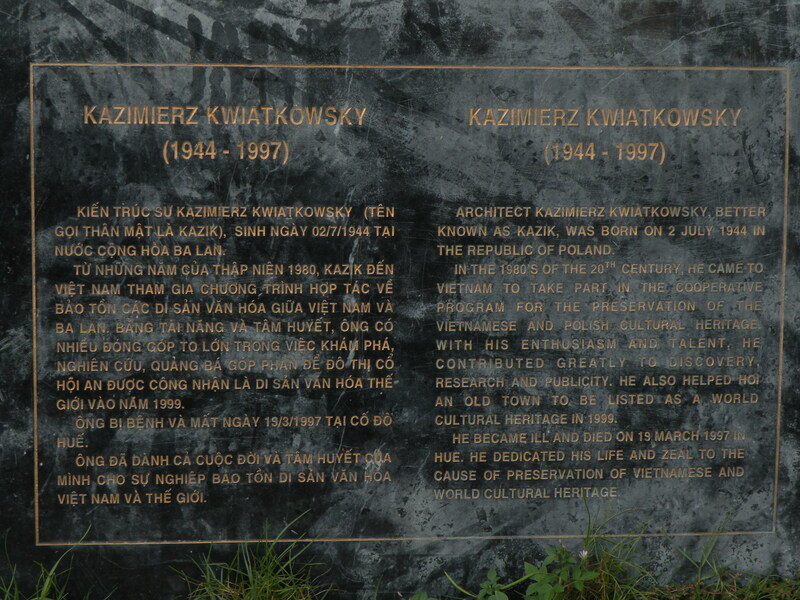 In 2007 in Hoi An Kazimierz Kwiatkowski monument was unveiled, considered here as a providential man who saved the historic complex before the disappearance, and contributed to the success of the city. 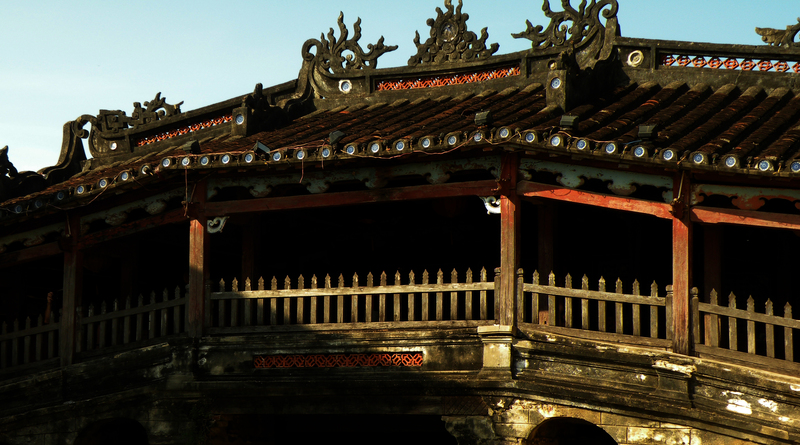 He’s attributed the chief merit of Hoi An entry in the register of historic World Heritage Site. 11.06.2012 I just found receipt from Hoa Binh Hotel (696 Hai Ba Trung St, Hoi An) – the room for 2 nights – $30, trip to My Son for two – $10. 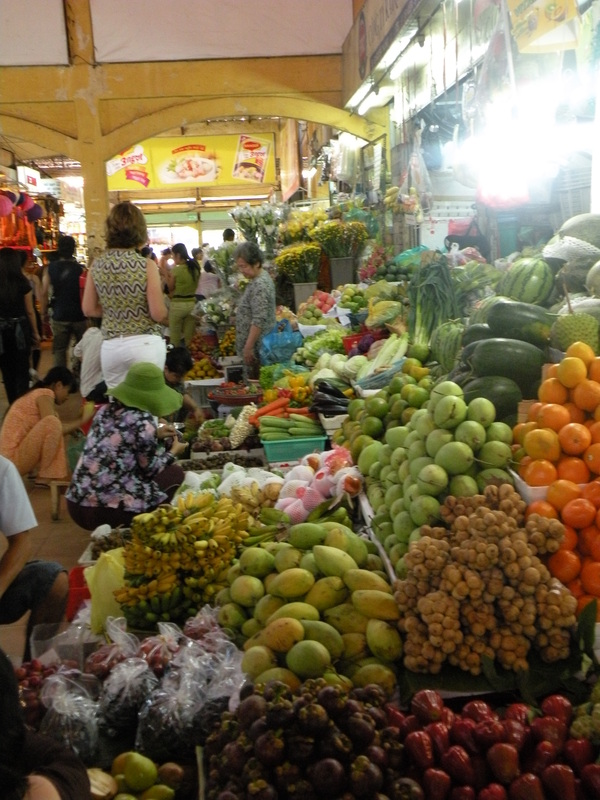 In Ho Chi Minh City we bought a Mekong Delta one-day trip. We decided against Cu Chi Tunnels and skipped floating market (I do regret it a bit); they say that Vietnamese market is not as colourful as the one near Bangkok. Still I would like to have seen it. 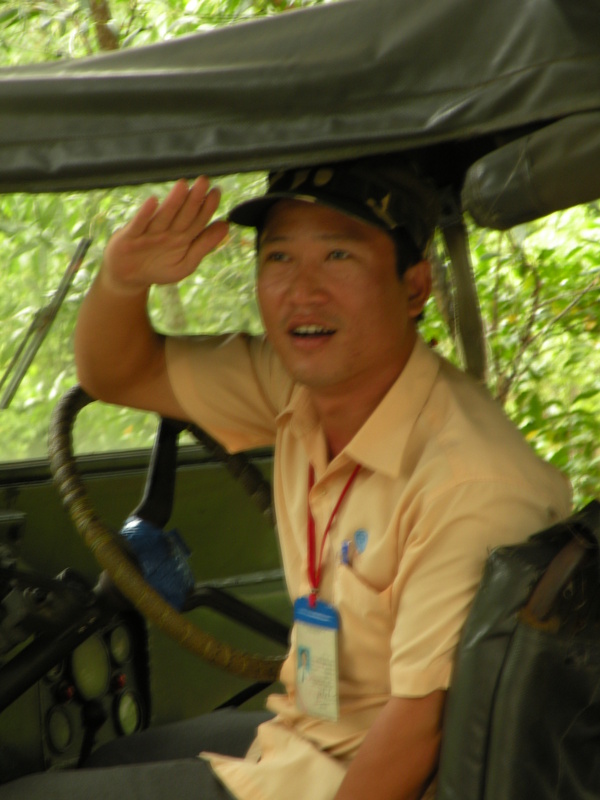 We really enjoyed Mekong tour. Leaving in the morning wasn’t that bad even though I remember being very tired. We got some sweet buns on our way to the bus. They were sweet and freshly baked, I remember I loved them. Oh by the way, we some crazy looking cakes in a cafe/bakery, western style. Feast for the eyes and decided to spoil ourselves one day. DO NOT MAKE THAT MISTAKE! Very expensive and very tasteless and old. 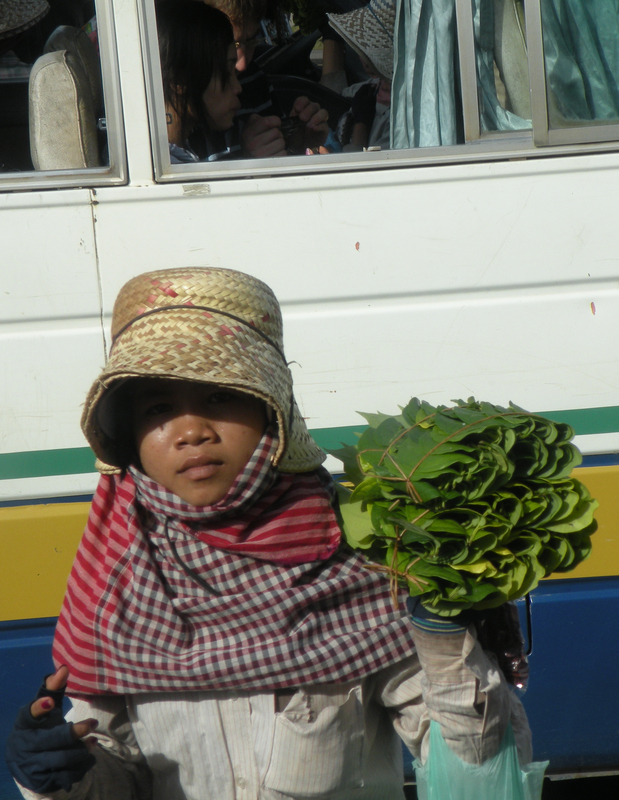 He explained why there are so many moppets in Saigon and so little accidents in the city. And the story behind helmets is that don’t really protect you when you fall. So beware. In Vietnam there is only one long highway along the coast (and one single train track almost next to it) which is called “hip-hop highway” imagine why… we found out it’s really true on a night bus while leaving Ho Chi Minh City. The trip included: transportation to a boat on the riverbank, visiting fruit farm (we tasted some caramelised fruits, were able to hold a snake and touch the wax hive cells in between the bees – our guide was convinced we don’t have bees at home), visiting small manufacture where they produce coconut candies in old fashion way (BTW it’s more expensive to buy it there than in a regular shop), and the best part of it all – rowing boat ride in Mekong canals (LOVED IT) to a place where you’ll get something to eat and listen to traditional music (opinions were divided, I liked it, but I have to admit only after getting used to strange sounds). It’s a shame I didn’t do a recording. 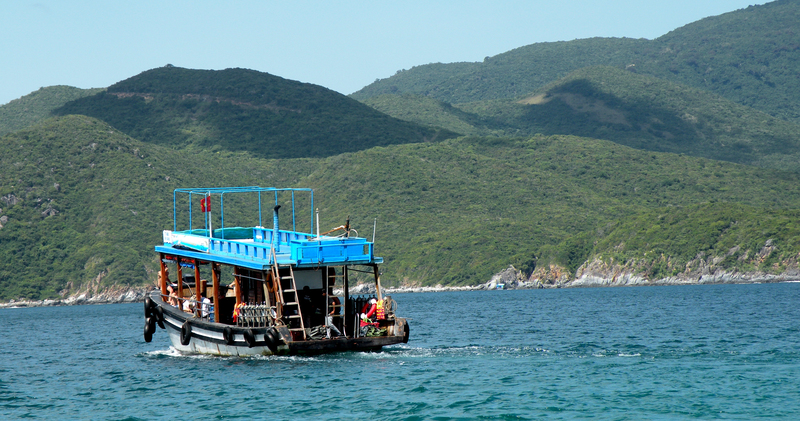 Anyway then the guide wanted to convince everyone to go back by motorboat, we didn’t do it, it was a bit too expensive. Anyway don’t believe him when he says you will be stuck waiting for another group or in traffic on your way back. As far as I remember it was a quick one. The coconut candy process is really very simple. First you need to crack the coconut. Veeeeerrrrryyyy simple… have a look at the blade that helps you do it. Then you take the milk and pulp out. The milk is then cooked with malt syrup and sugar on a stove, being constantly mixed to avoid lumps. What comes out is a condensed milk to which they add various ingridiens. 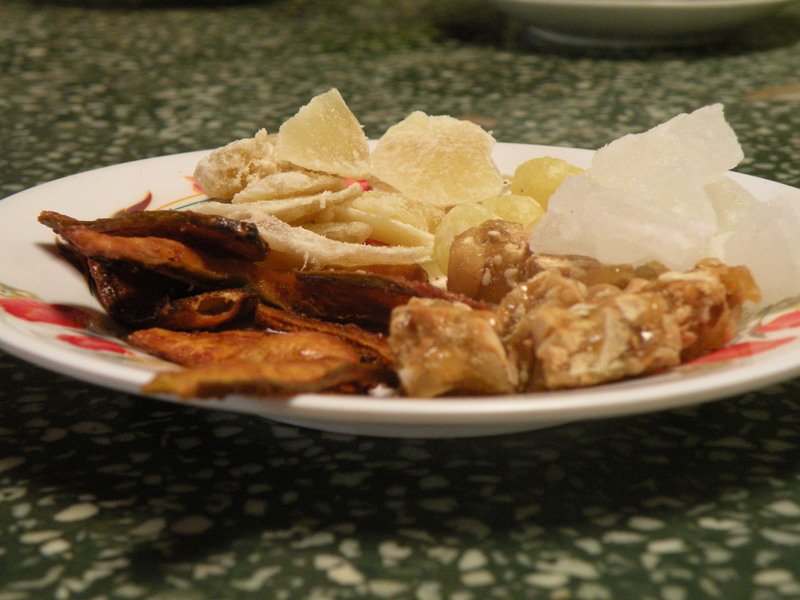 The sweets come in different flavors – chocolate, coconut, durian, and nuts. When the pulp is thick they pour it over board with grooves to shape them and let them thicken even further. The sweets are then cut and wrapped into wax paper. Ca tru requires at least three performers. 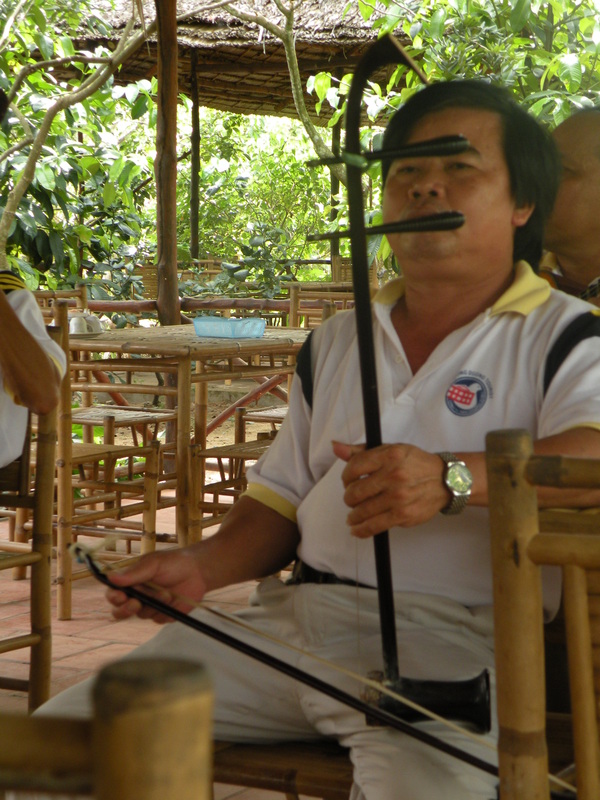 The singer is always a woman and plays the phach, an instrument made of wood or bamboo that is beaten with two wooden sticks. 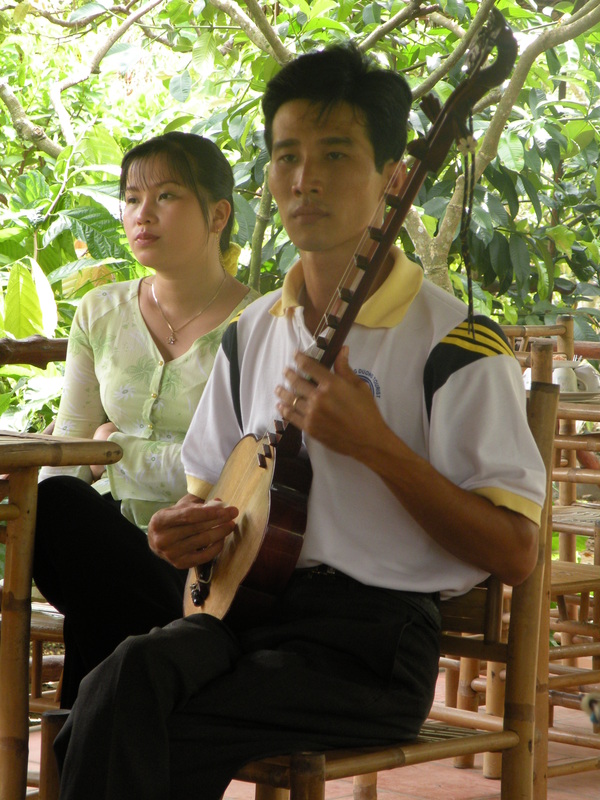 A musician accompanies the singer on the dan day, a long-necked lute with three silk strings and 10 frets. There is also a drummer or trong chau. The drummer shows his approval of the singer or the songs depending on how he hits the drum. If he likes a song he might hit the side of the drum several times. If he is disappointed with the singer, he hits the drum twice. The guitar player must follow the rhythm of the phach. His instrument, the dan day, is only used in ca tru and is now made almost exclusively for sale to tourists who find the shape intriguing. Bến Thành Market – in the heart of the city just opposite to the bus station (located on the side of huge round about by the way). I got really scared inside. The alleys between stalls are very narrow and unoccupied sellers had nothing to do but to occupy themselves with bothering us to buy something. At some point I thought they are going to rip us apart. Each one was pulling me in a different direction shouting “buy something! BUY SOMETHING!” I was so stressed out I didn’t even want to buy anything, all I wanted was to scream and run away. It looks lovely, there is so much of colourful stock all around you feel like in a treasure cave but you don’t have a moment to take it all in as constantly someone is bothering you. And it is expensive. It’s a tourist attraction so what should one expect?! I bought some coffee in there and regretted it the moment I saw prices outside and again regretted it when I had to drink it. Maybe I’m just not big fan of Vietnamese coffee. Outside the market there are little shops that offer prices lower than the stalls inside the place. How crazy is that? We bought there the traditional straw hats. And we also went to a local restaurant around the corner. The menu was only in Vietnamese and there were no tourist around. I didn’t want anything to eat but P. ordered a soup which he really enjoyed. I know we looked inside the pots and showed what we wanted. Liking soups comes really handy sometimes. 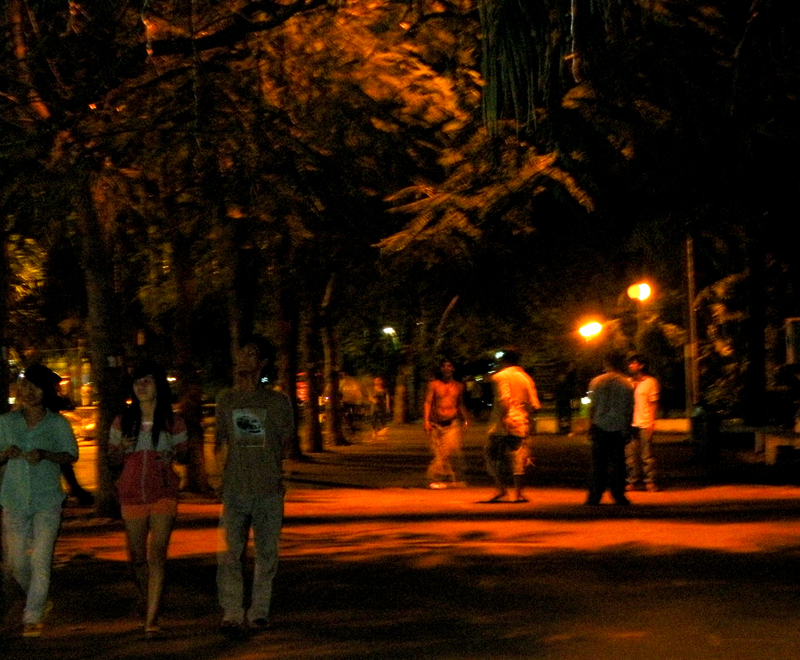 At night there is a night market just outside Bến Thành. Long rows of stalls with clothes and food mainly. 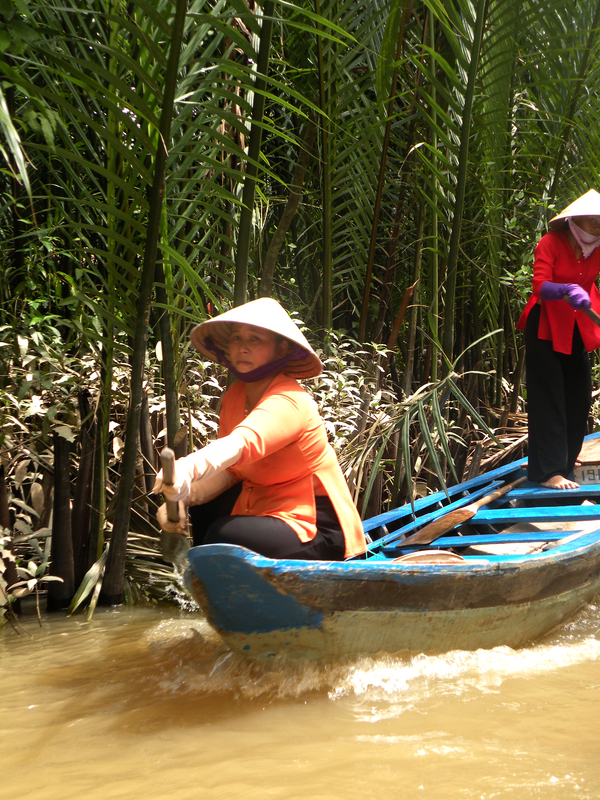 We got there some linen pants and blouses for the trip to Mekong Delta we planned for the next day. The pants had no pockets and the ripped apart really quickly so even though we bargained a lot I think it wasn’t worth it. Dam Sen Water Park – 03 Hoa Binh, Ward 3, District 11. Anyone that needs to rest will find it perfect for that purpose. The taxi was horribly expensive but we were afraid we won’t get there and we couldn’t find out from our hostel hosts which bus is going there. So we paid for a taxi something really stupid and came back by bus (number 11) which was terribly cheap. The entrance was something like $5. Don’t make the same mistake I did though. Watch out when you go on Kamikaze slide. I hurt my back bone so badly it hurt me even a couple of weeks after we were back in London. 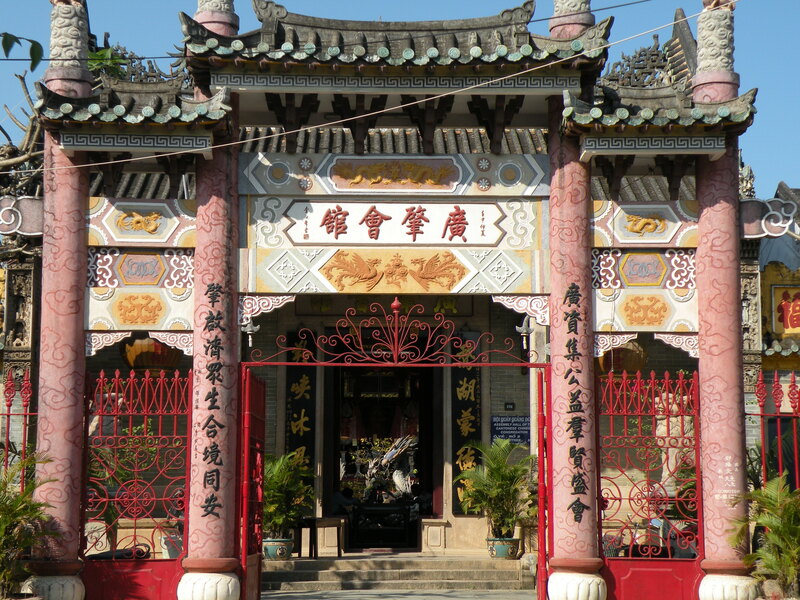 Hung Kings Temple – right across the entrance of the History Museum. 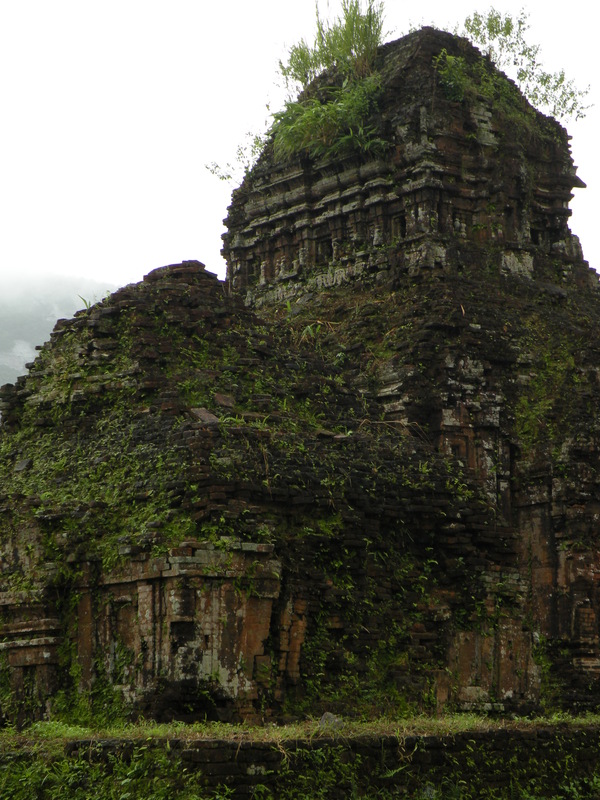 The temple was built on Nghia Linh Mountain, there are three levels connected by stone steps. 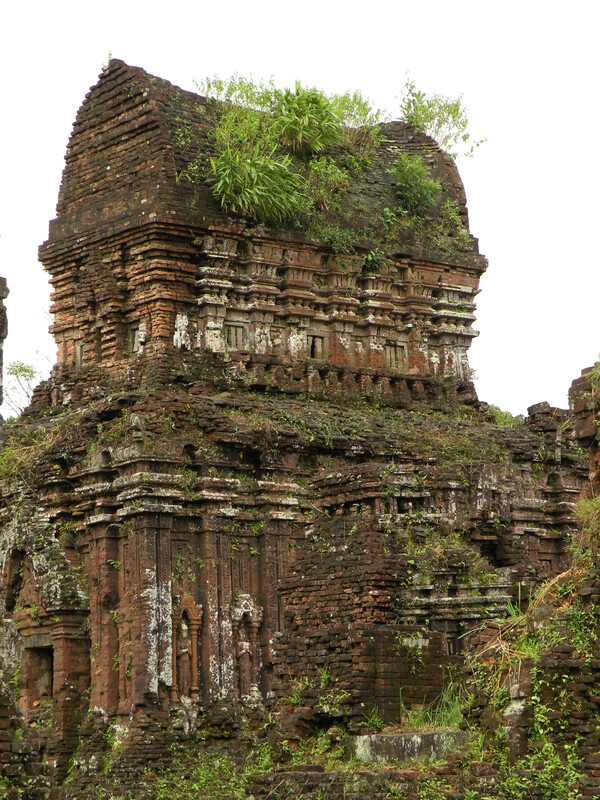 The lowest level Ha Temple (worshiping Au Ho), middle level Trung temple (worshiping the Hung Kings), the highest level Thuong temple (placing the mausoleum symbol of the Hung Kings). 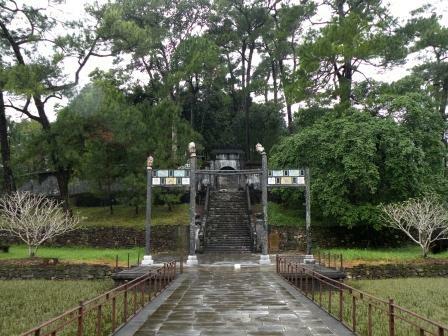 The Hung Kings temple is not only a beauty spot but also the site in memory of the national origin. 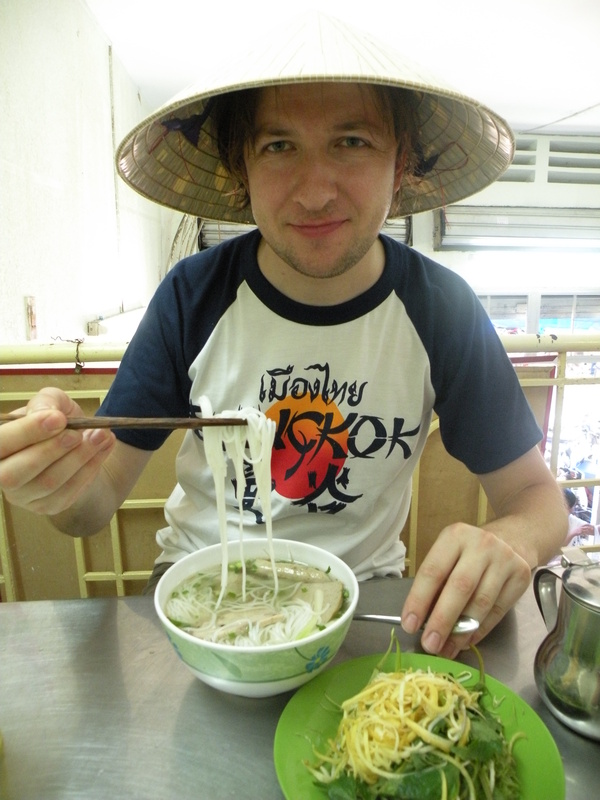 Our favourite Restaurant – KIM on De Tham Street – best food in Vietnam I have tried. 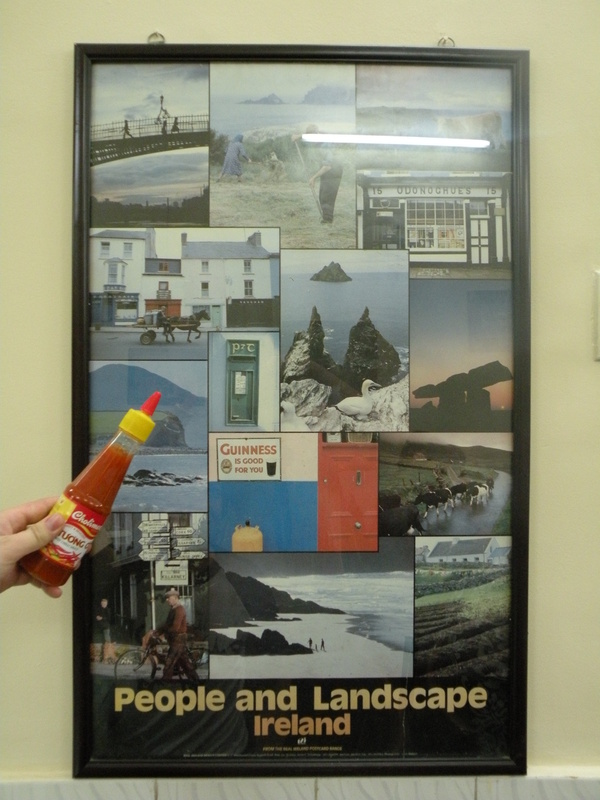 And there are some pictures from Ireland! The service is maybe not the quickest and not the best but the food is worth it. We always ordered more than we could eat. Oh the sauces and fish rolls yummy. The most amazing thing though is the traffic. Moppets, cars, pedestrians all mingling together without accidents. You just have to get a feel for it. 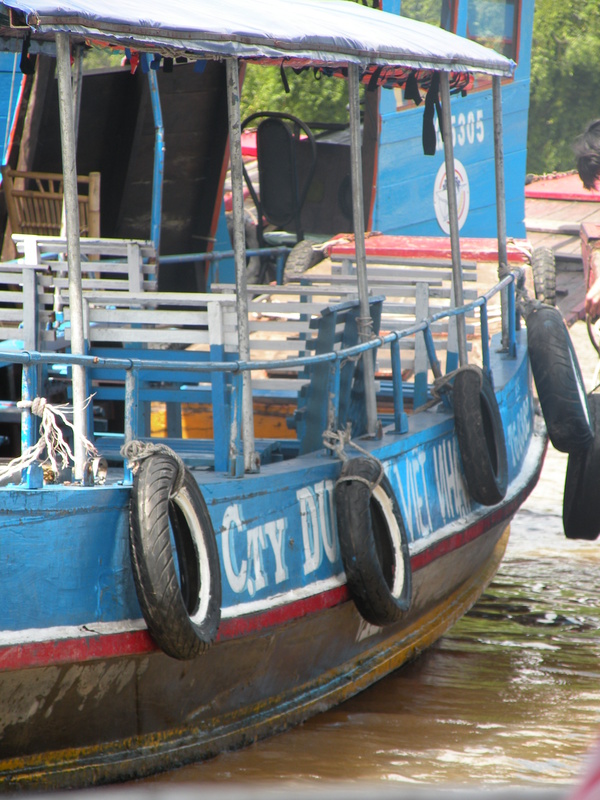 Next post about our trip to Mekong Delta. And so we arrived in Sài Gòn. 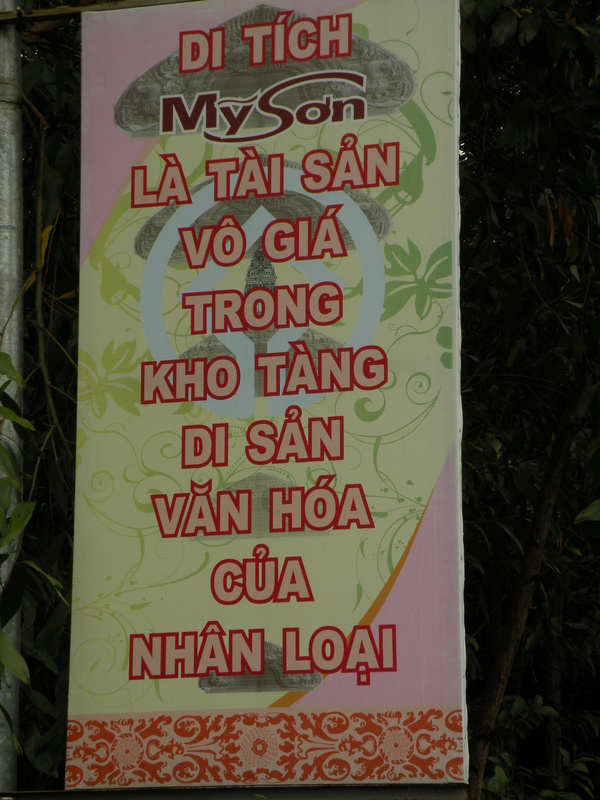 Saigon is now unofficially called only the central part of Ho Chi Minh City. 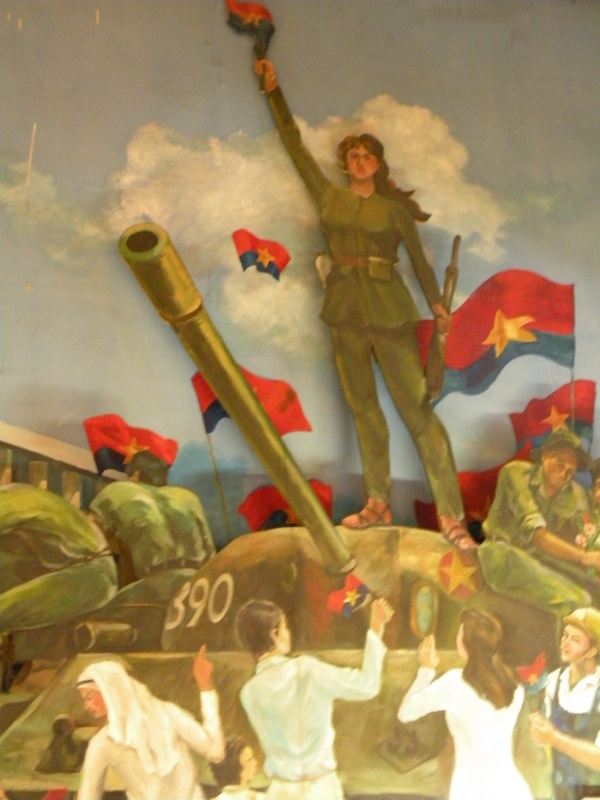 A bit of history: under the name Saigon, it was the capital of the French colony of Cochin-china, later after it was captured by the communists Saigon merged with the surrounding Gia Định Province and was officially renamed Hồ Chí Minh City after Hồ Chí Minh. 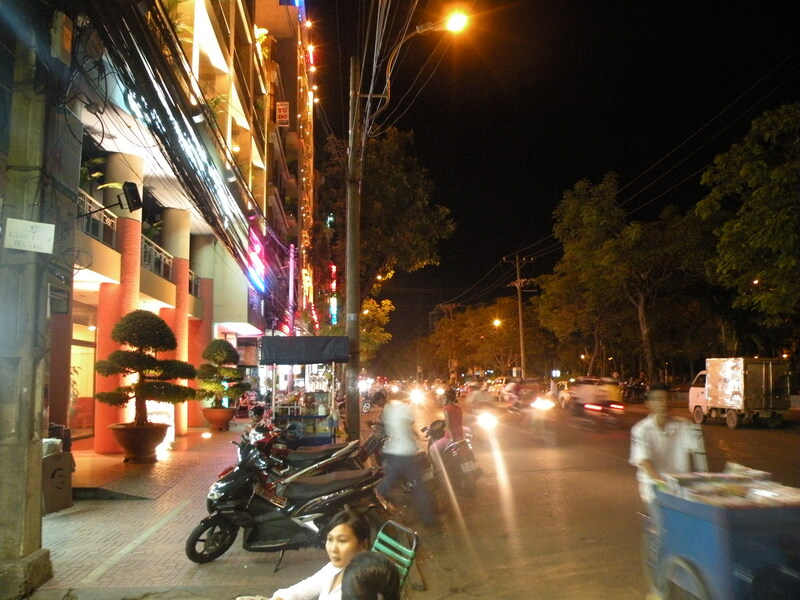 We arrived late evening in Pham Ngu Lao which is one of the main streets streets leading to central bus station. 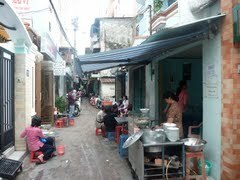 We booked first night in advance choosing location in walking distance from main market in Quan 1. The girls came with us. We figured we were staying they might have room for some more guests. Of course as soon as we stepped out of the bus were approached by a couple of touts trying to “help us” out in finding accommodation. 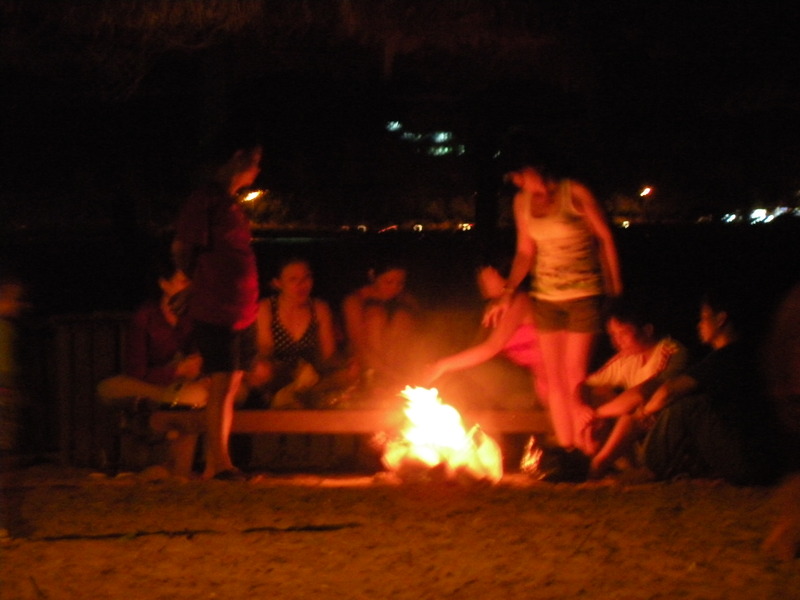 Most of them were gone in a second as soon as we told them we already booked a place. One stayed though. 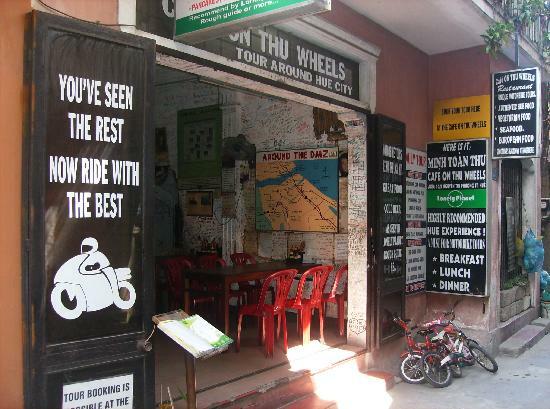 After showing him the booking he offered to show us the way – the hostel was his brothers place. Lucky us. As we entered the narrow labyrinth of tall buildings (most of them looking exactly the same) we felt lost after a few turns. Imagine enormous orient city bustling with night life, shouting people walking in every direction with a lot of traffic and moppets, where at every point somebody wants to sell you something. And then you enter dark and narrow labyrinth of dogy looking buildings where from every corner a pair of eyes is looking at you. Or at least it feels this way. Some doors are open and show interiors of poor flats with small tv sets and kitchens, lying bamboo mats on concrete floors with their owners sitting there, resting. Cockroaches and cats coming from dark corners in between your feet. And the way is never straight, you take right then left then again right and you are lost. Was it first right or maybe second? When we arrived at our hotel after a long discussion in English/Vietnamese thanks to the help of our guide we established that our rooms were taken by people who decided to stay for one more night. Luckily there was another hostel in “the family” where we could stay. It was just freshly opened. Three minutes later we could unpack and take a hot shower. So did the girls. I can honestly recommend it. Check out: My Home, 241 / 43 Pham Ngu Lao Street, Ho Chi Minh City 70000. It was clean with air conditioning and Internet access. It also has a laundry area and drying roof. The woman that was taking care of the hostel did not speak much English but we could arrange for everything we needed at that time. On the picture on the right in the background you can see guys playing Jianzi – Hacky Sack. We brought one of these home.